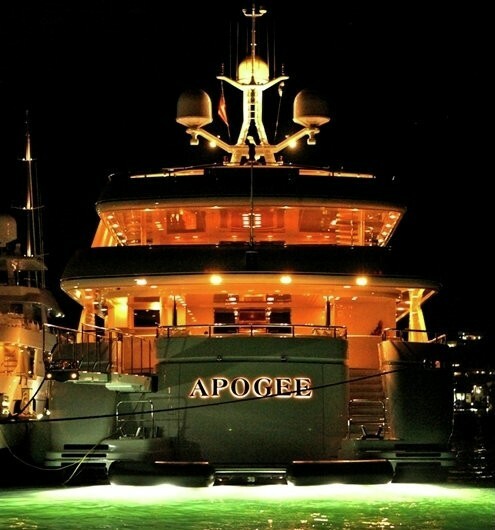 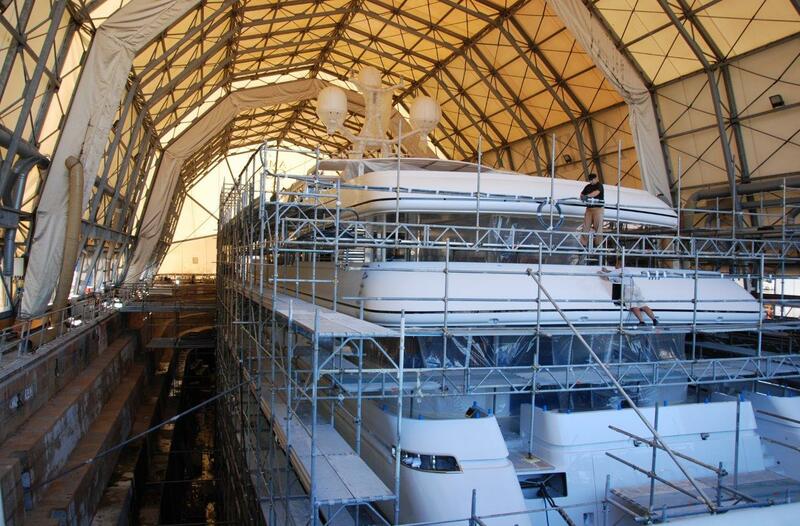 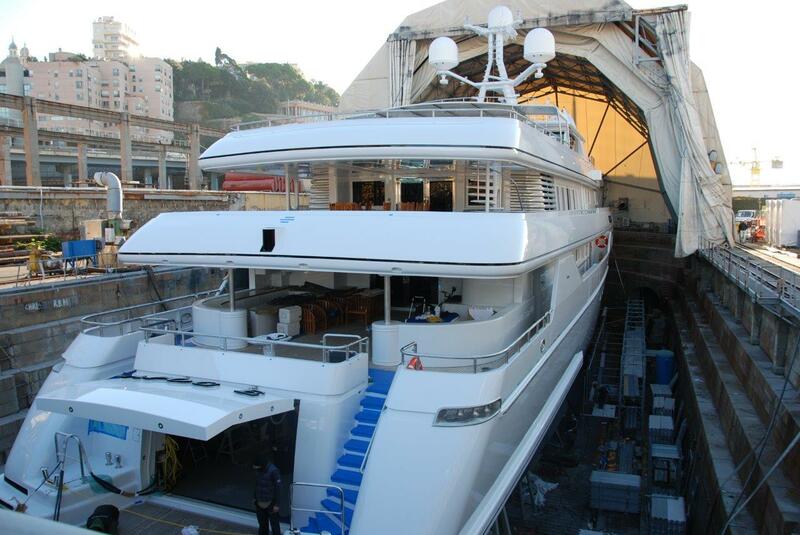 Luxury yacht APOGEE from Codecasa is constructed from a 63m/205ft steel hull and aluminum superstructure and was delivered in 2003. 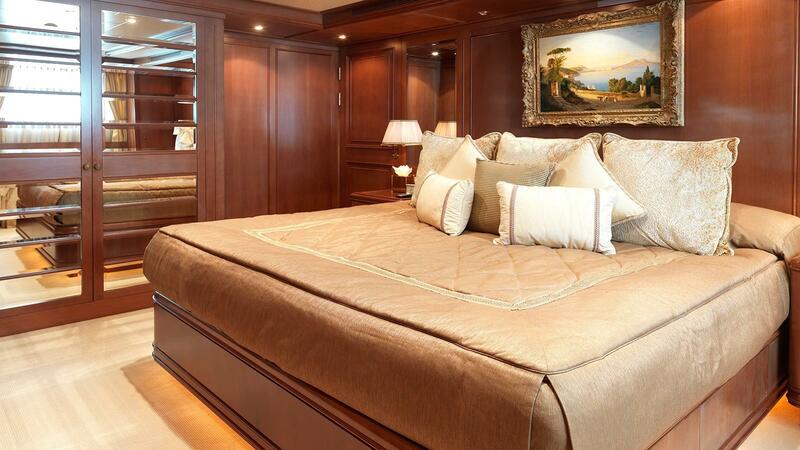 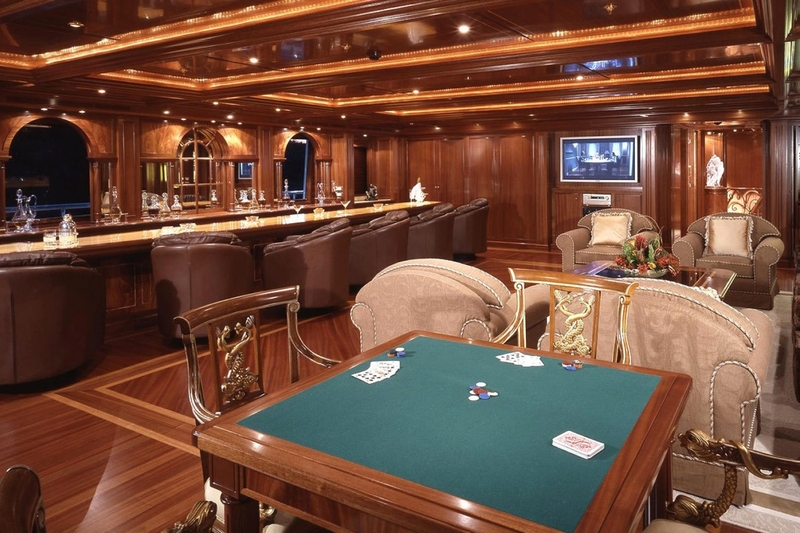 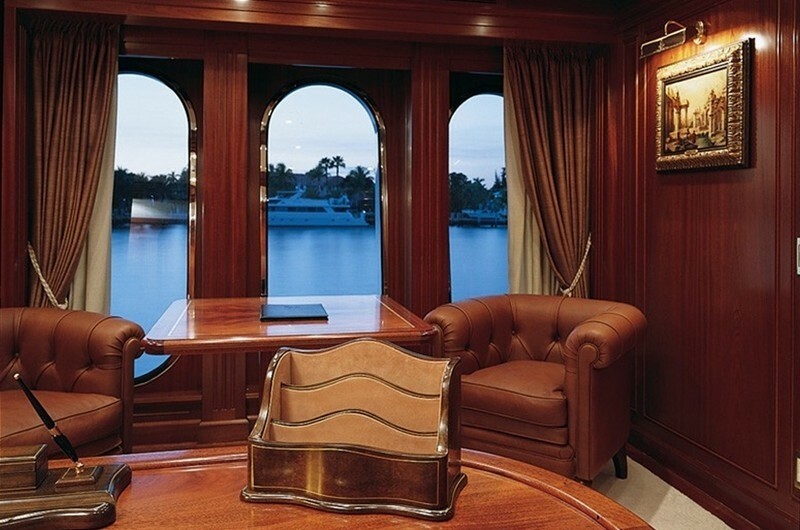 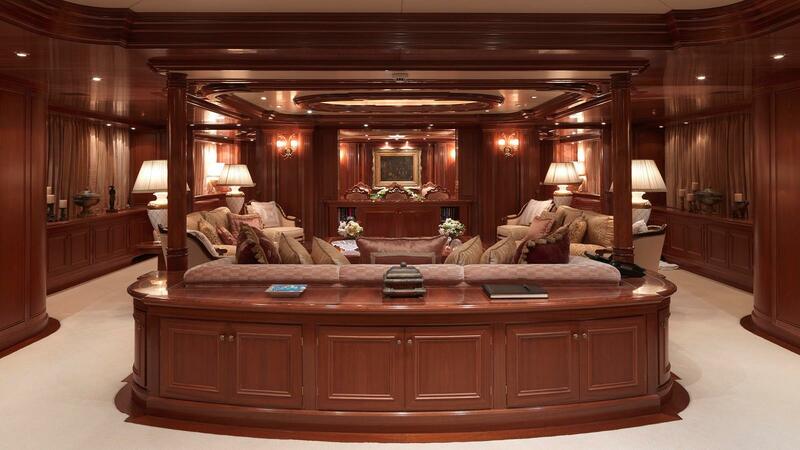 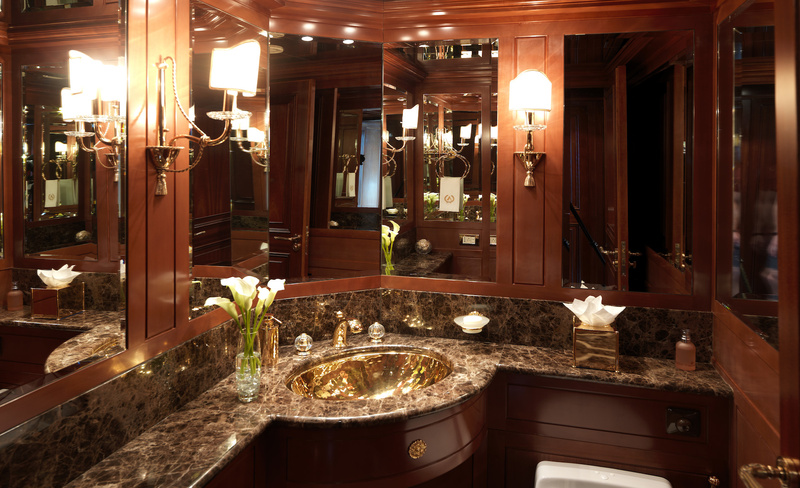 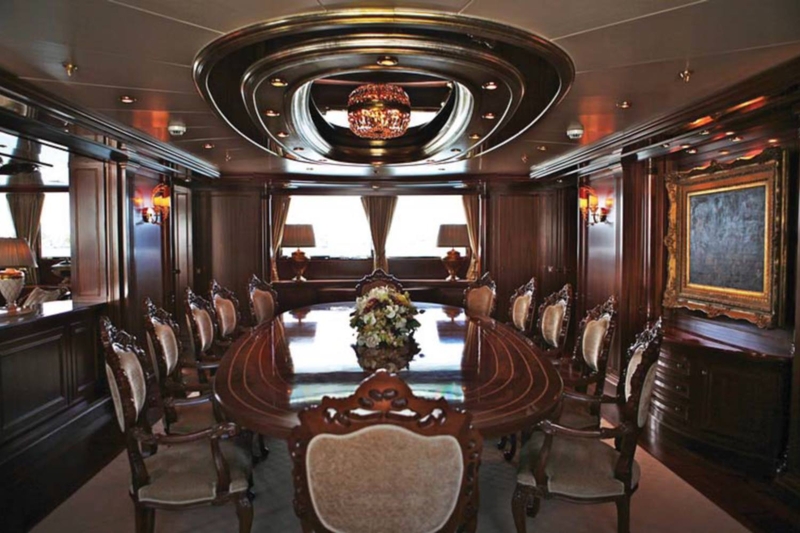 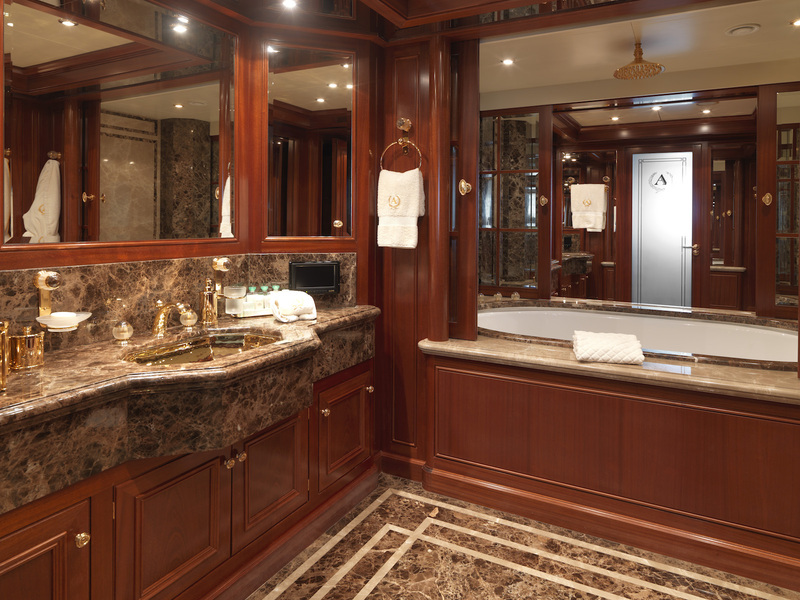 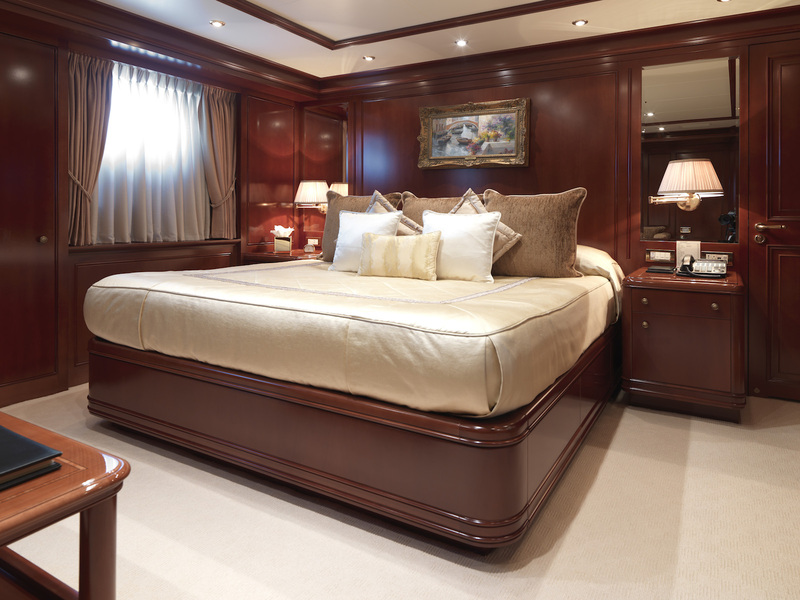 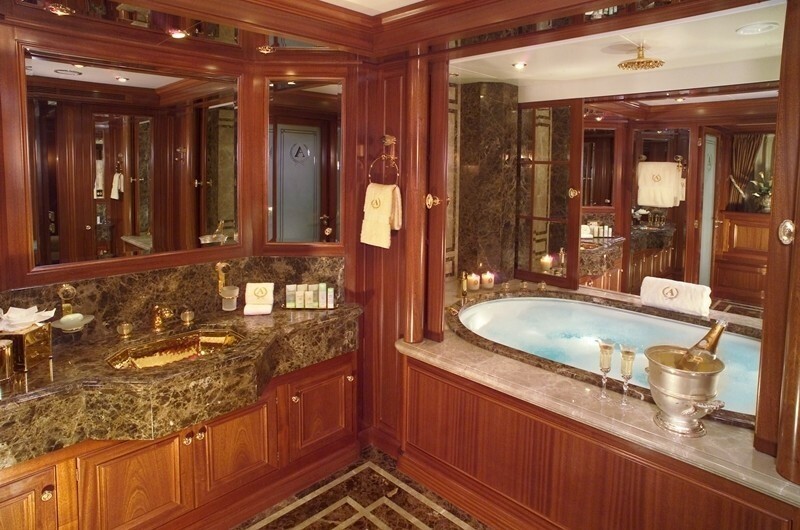 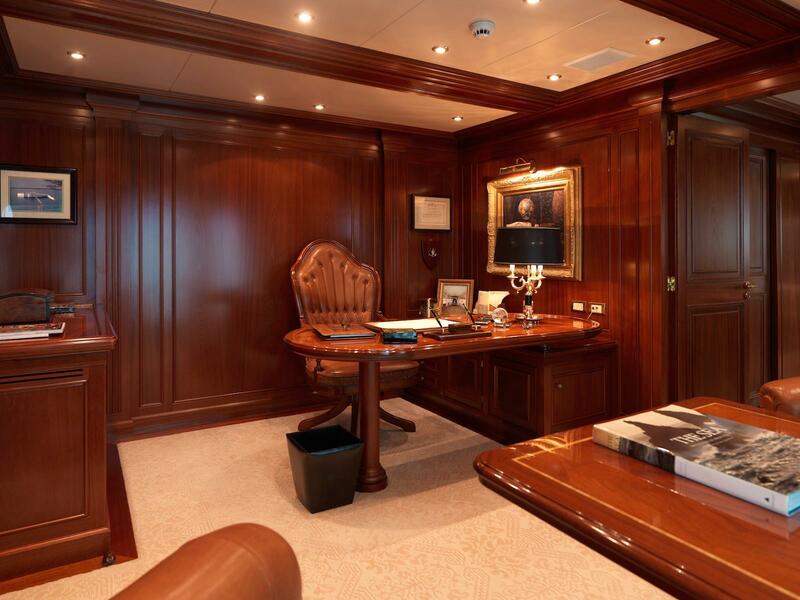 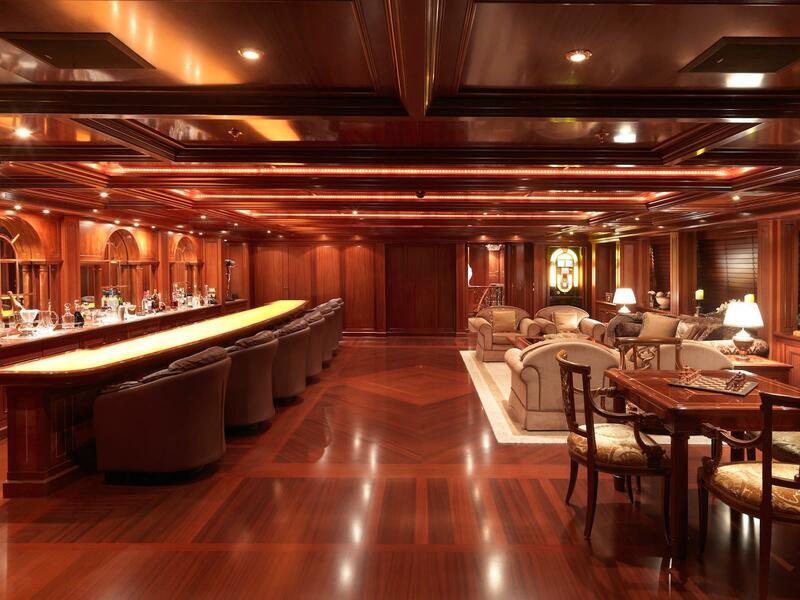 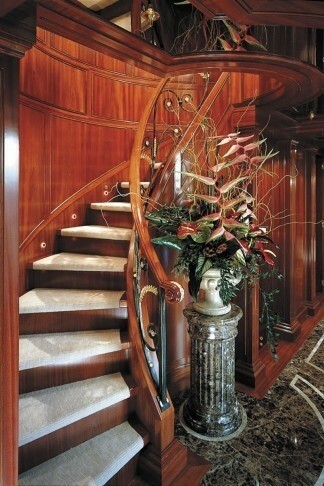 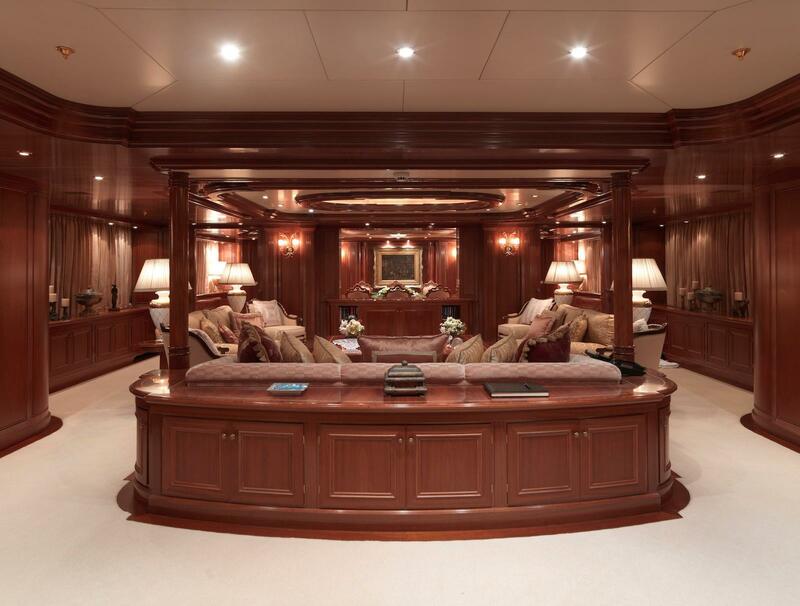 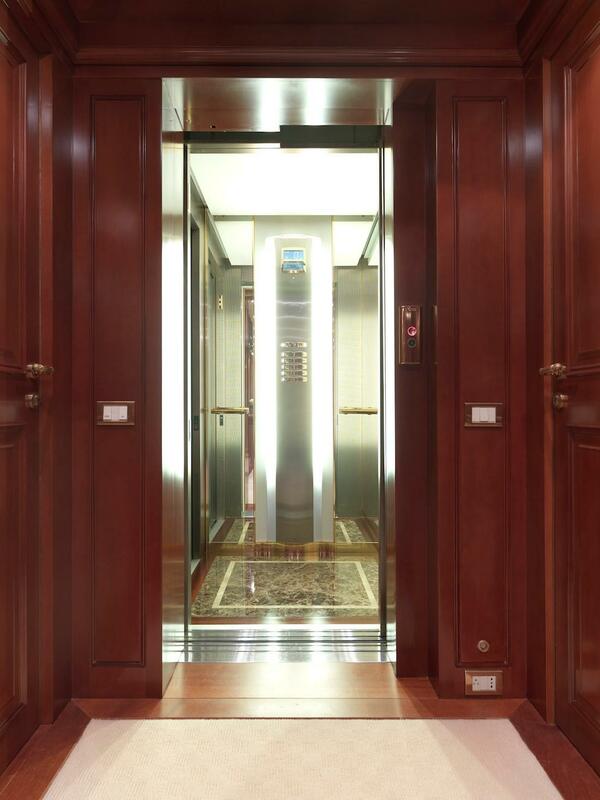 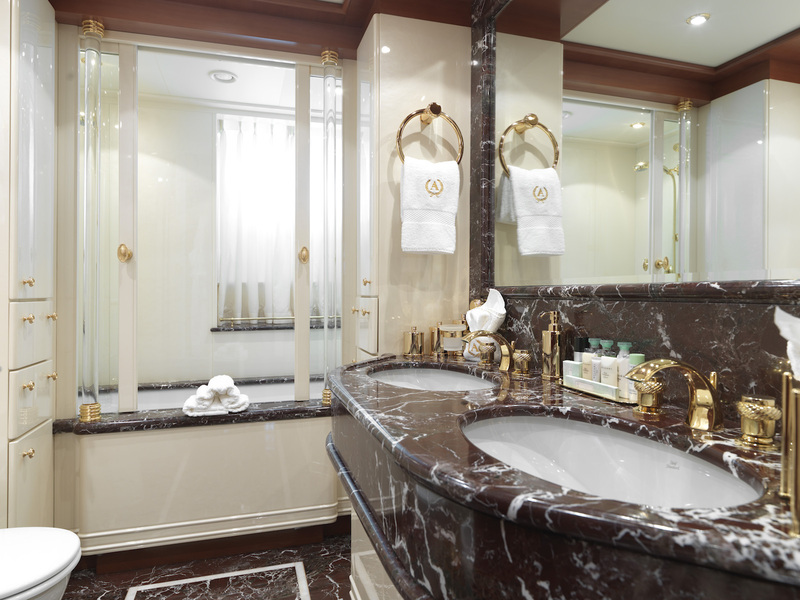 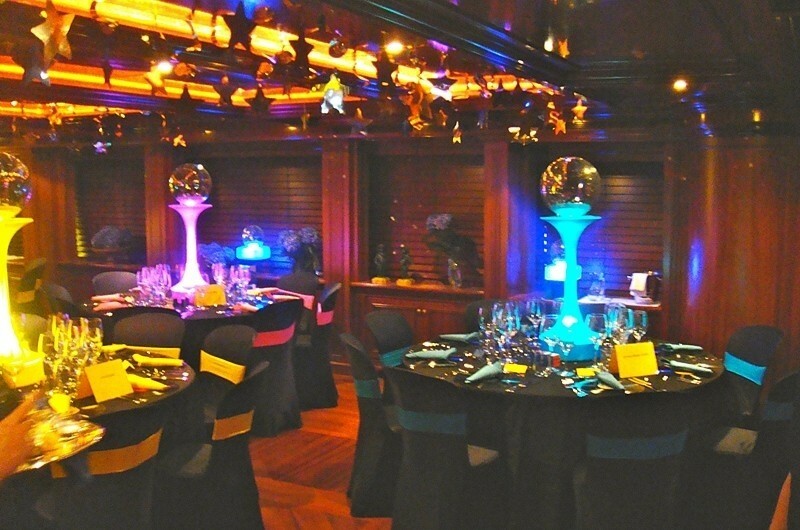 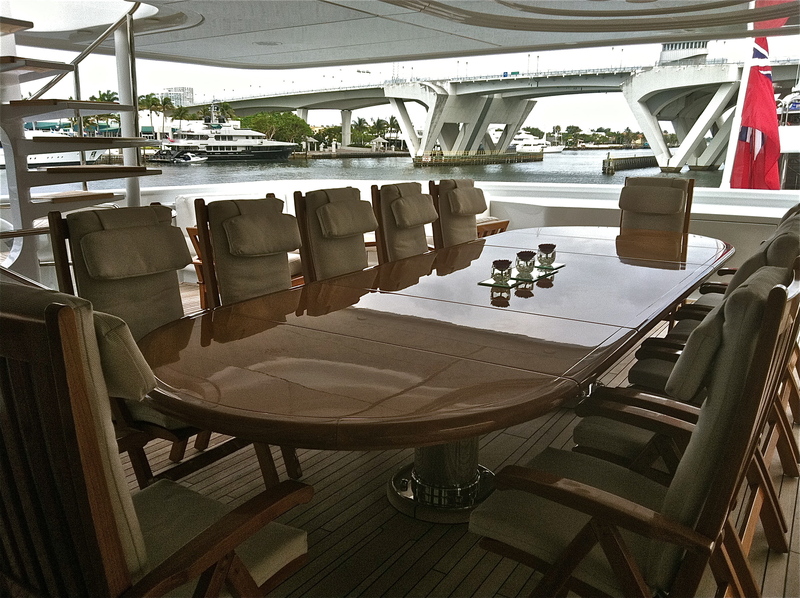 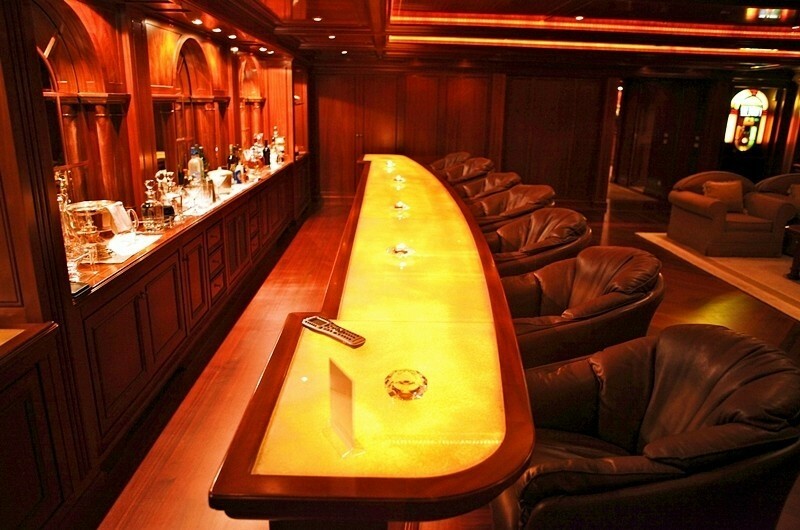 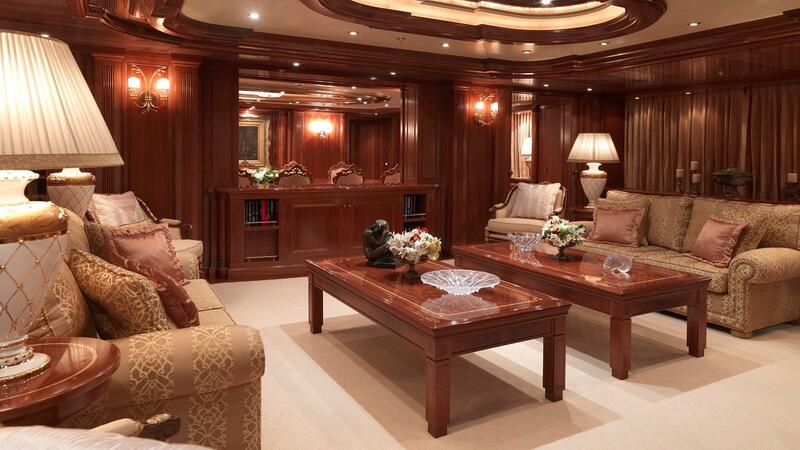 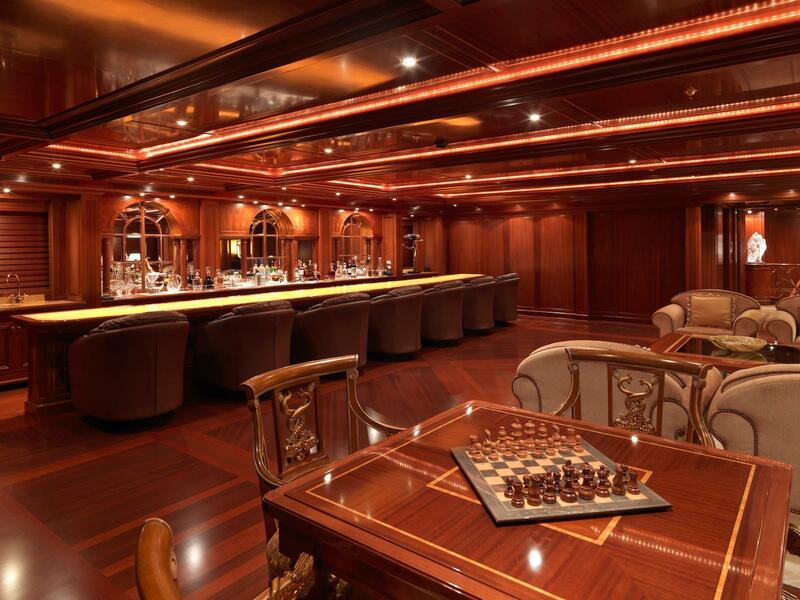 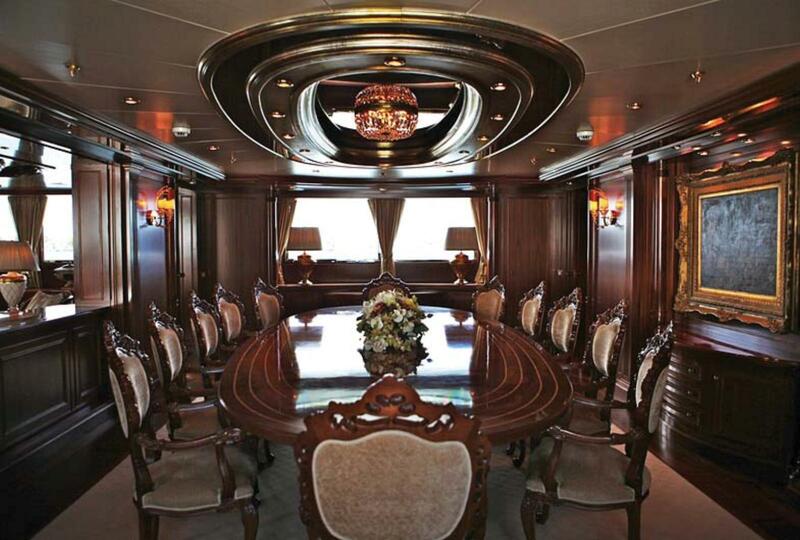 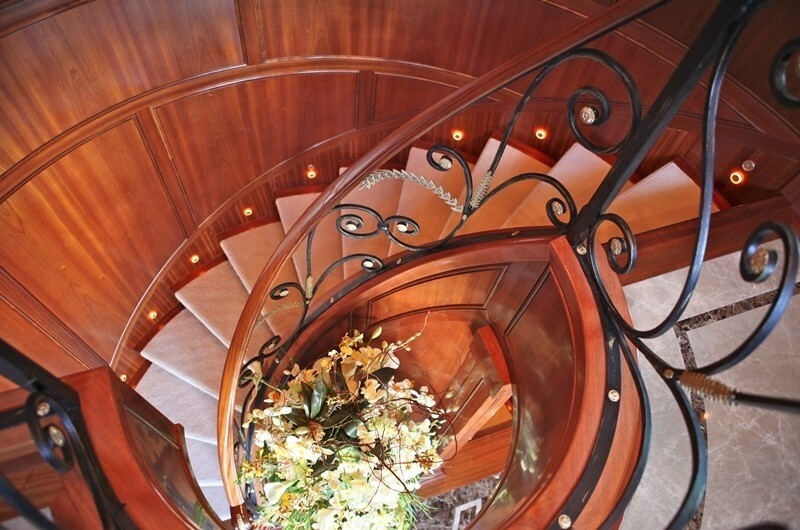 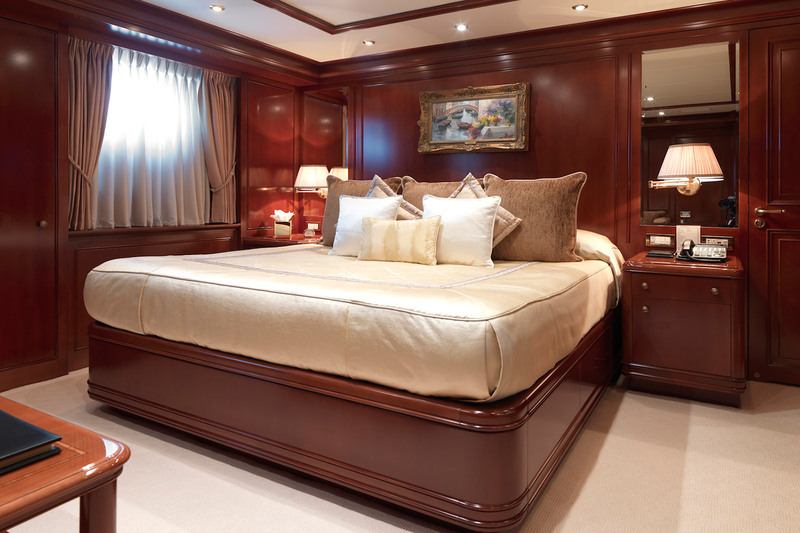 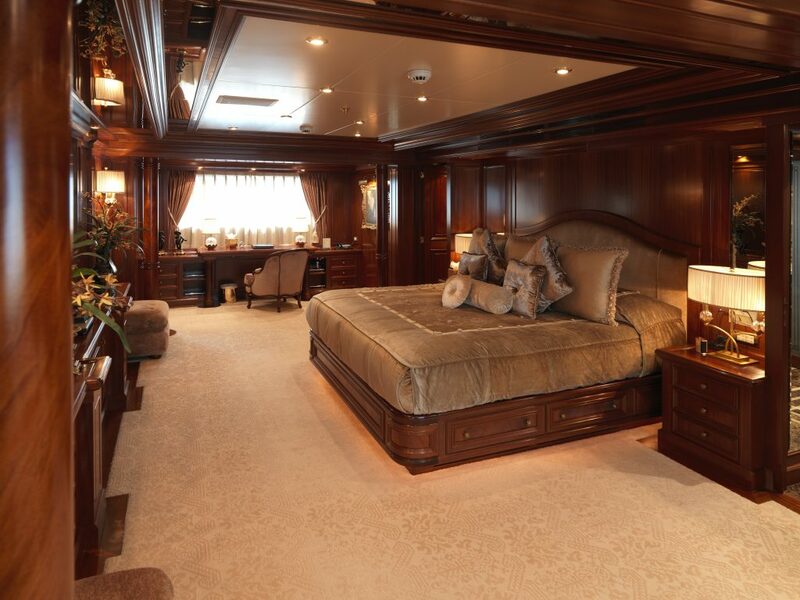 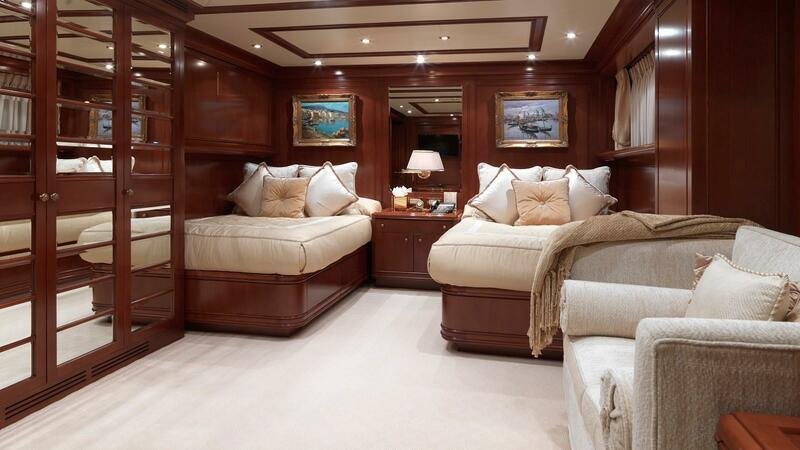 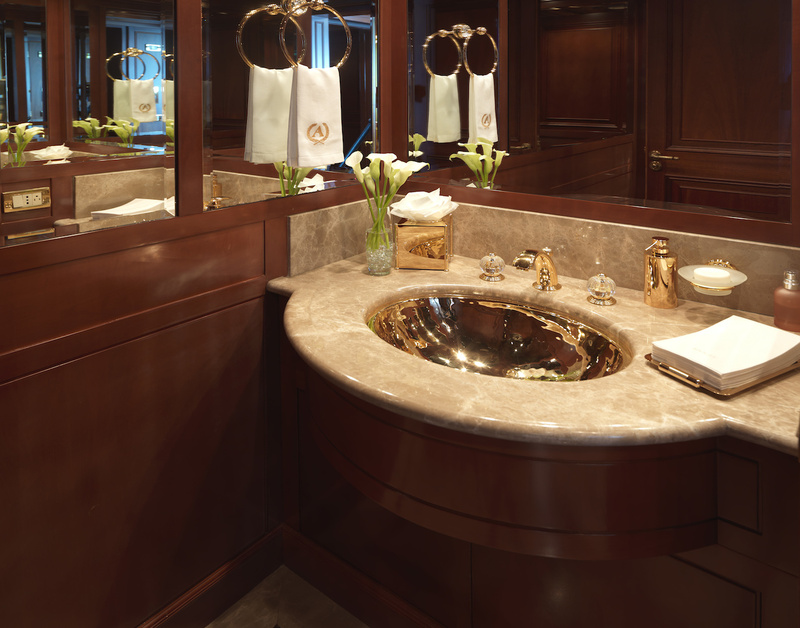 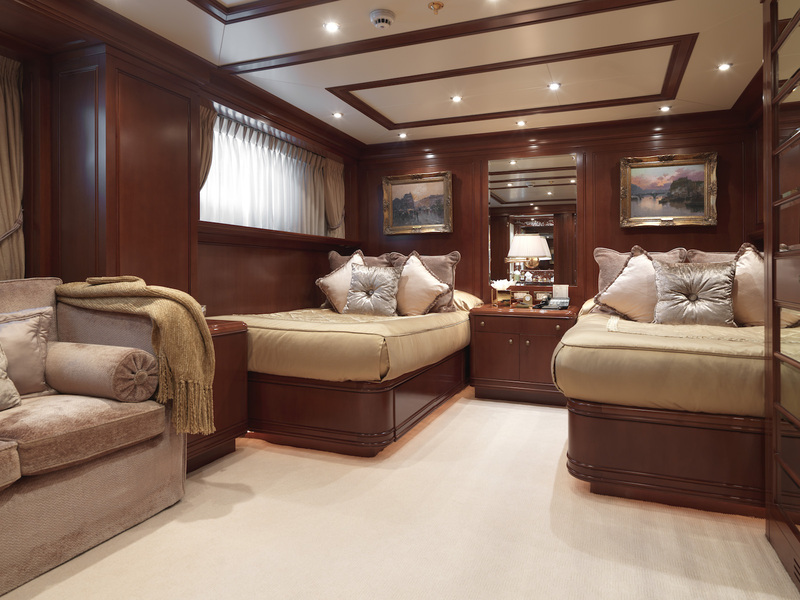 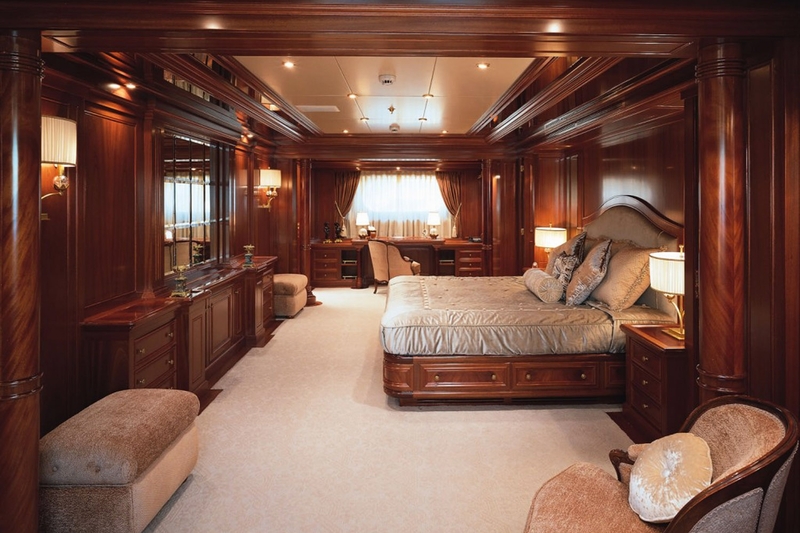 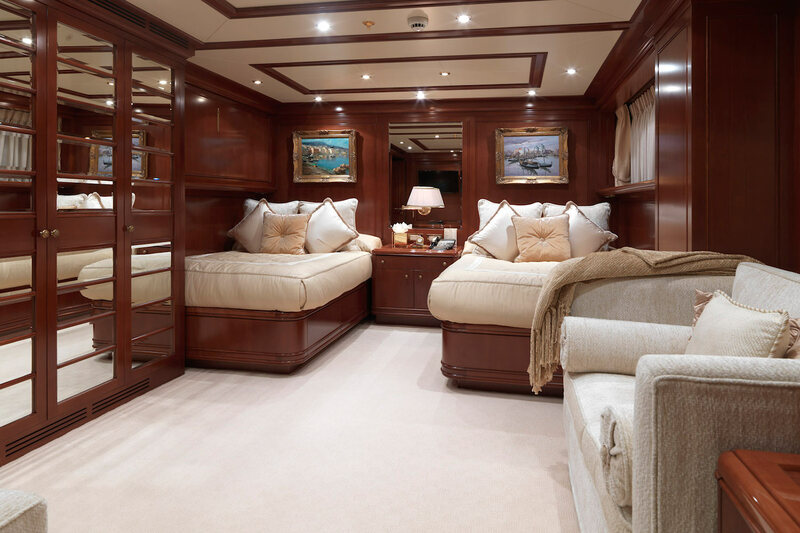 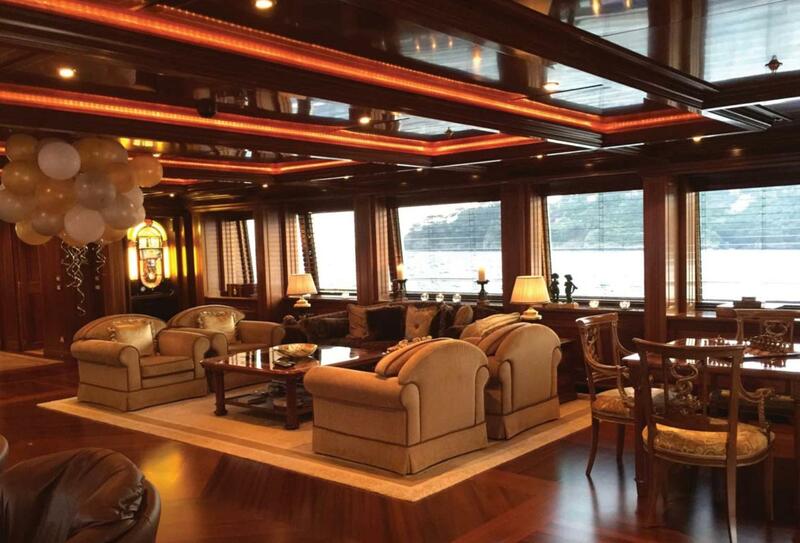 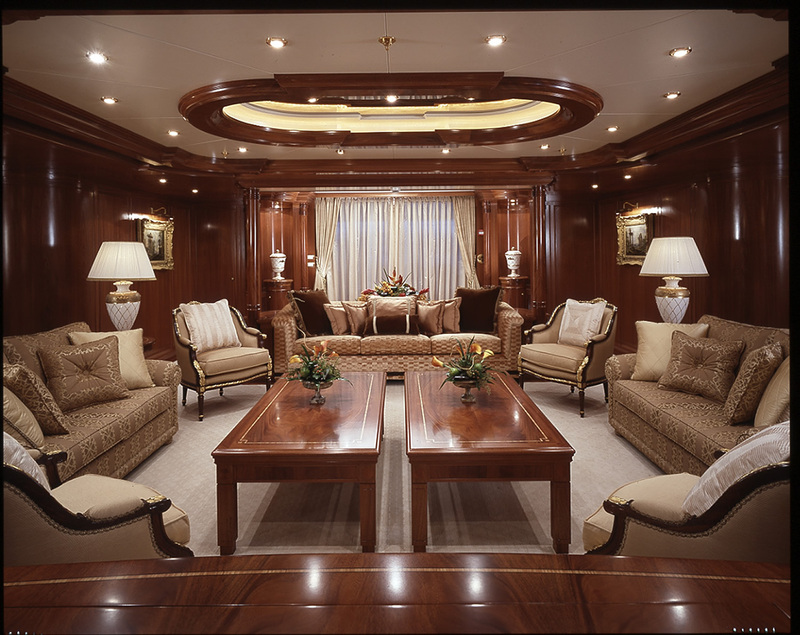 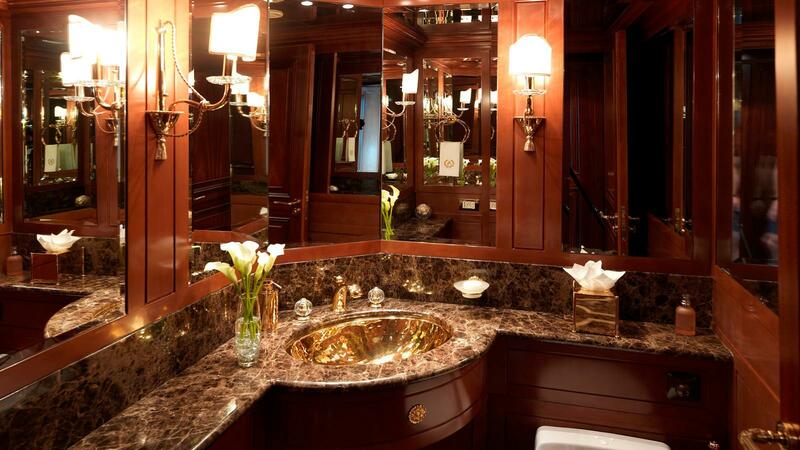 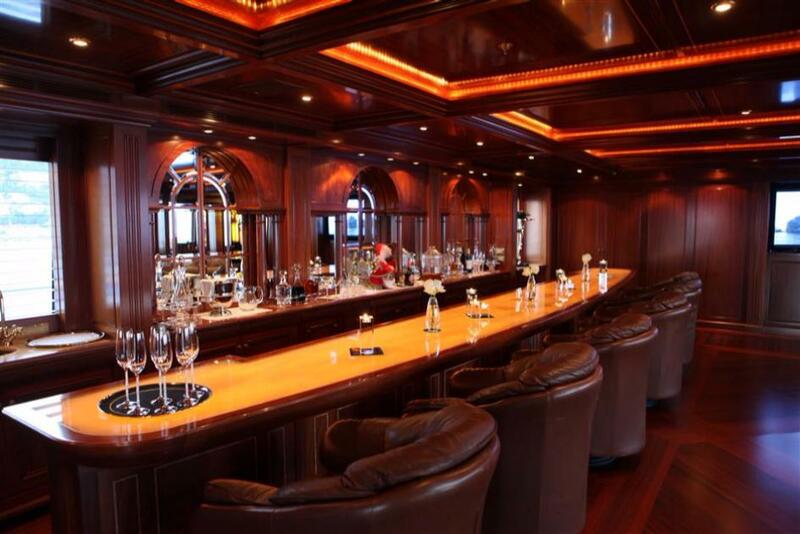 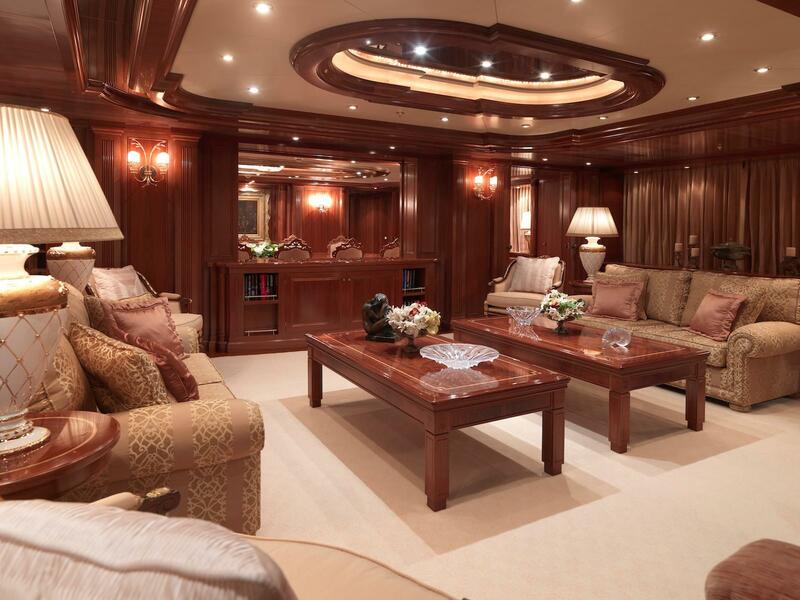 Her refit in 2013 was completed by Amico & Co., and the original interior was styled by Della Role Design using rich mahogany paneling and quality furnishings. 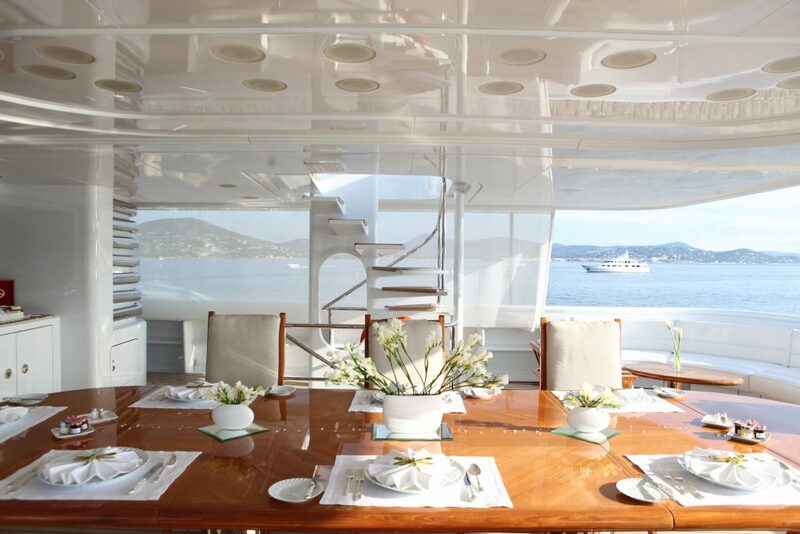 Up to 12 guests can sleep aboard over seven comfortable cabins. 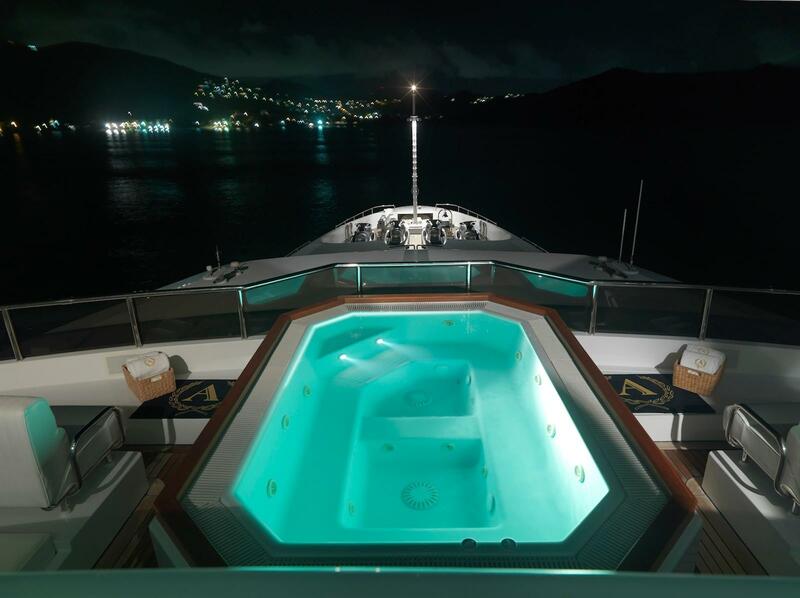 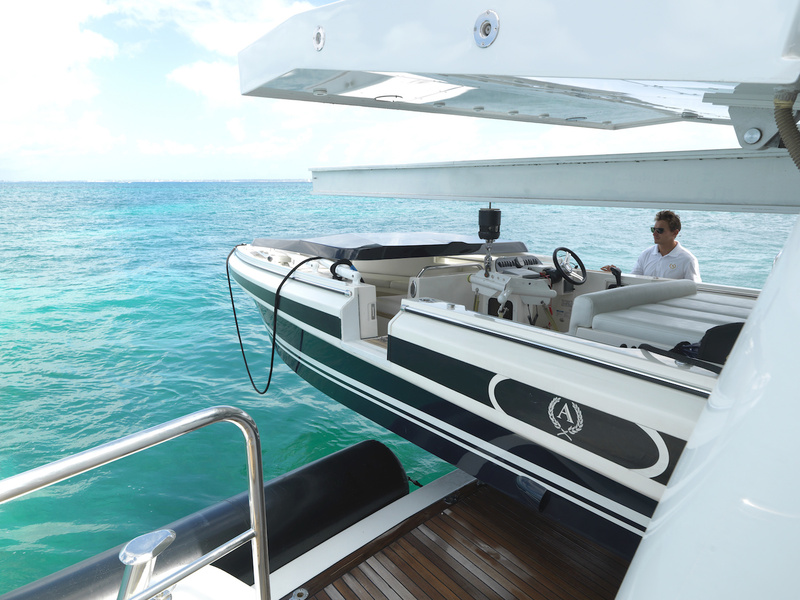 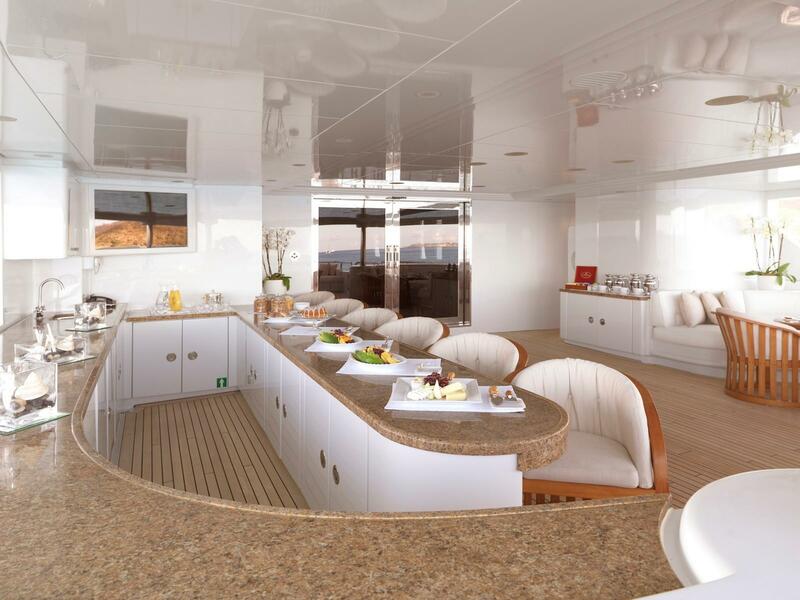 From the swim platform, two stairways connect up to the extensive main deck aft which has a comfortable seating area along the stern for informal alfresco dining and outdoor living. 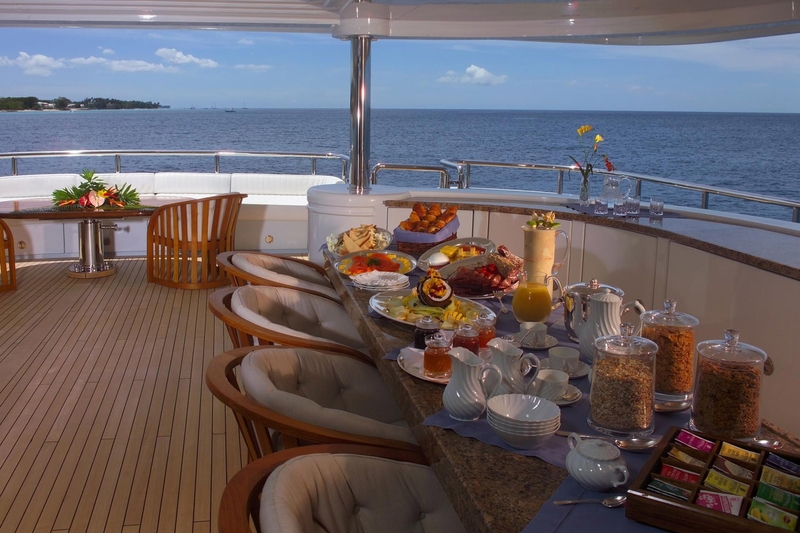 There is a second sofa placed on the starboard side, and the bar opposite is ideal for breakfast and refreshments throughout the afternoon. 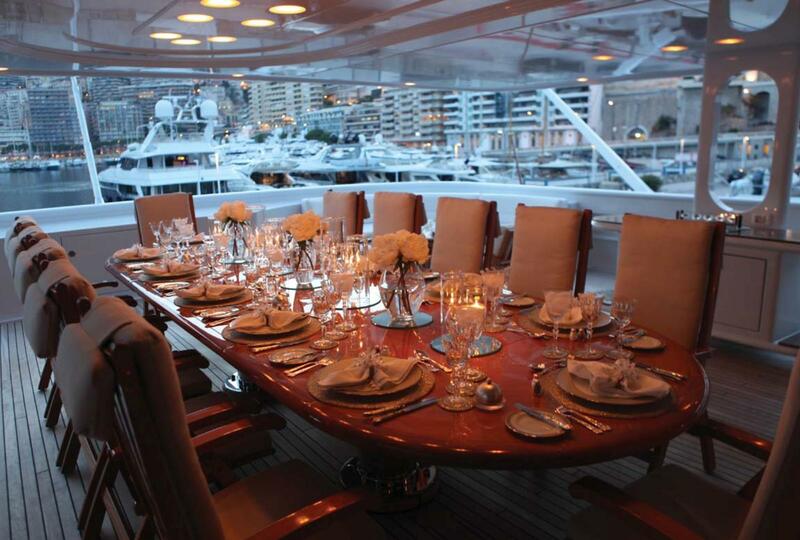 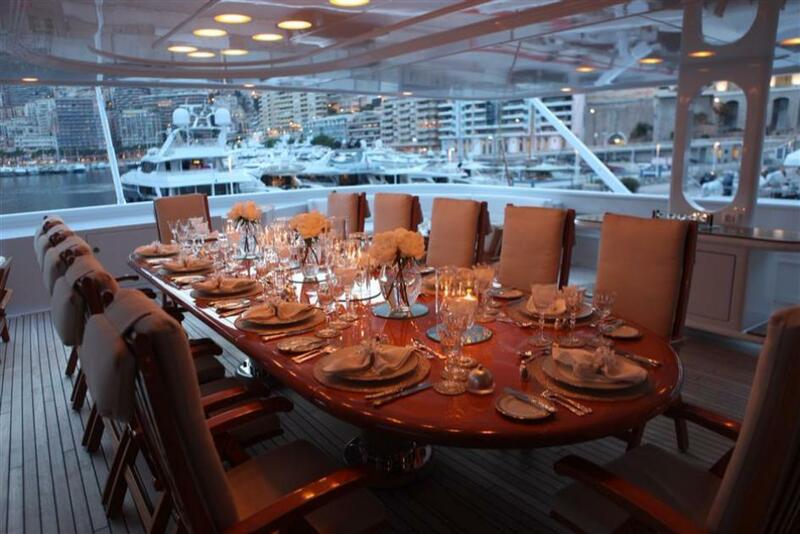 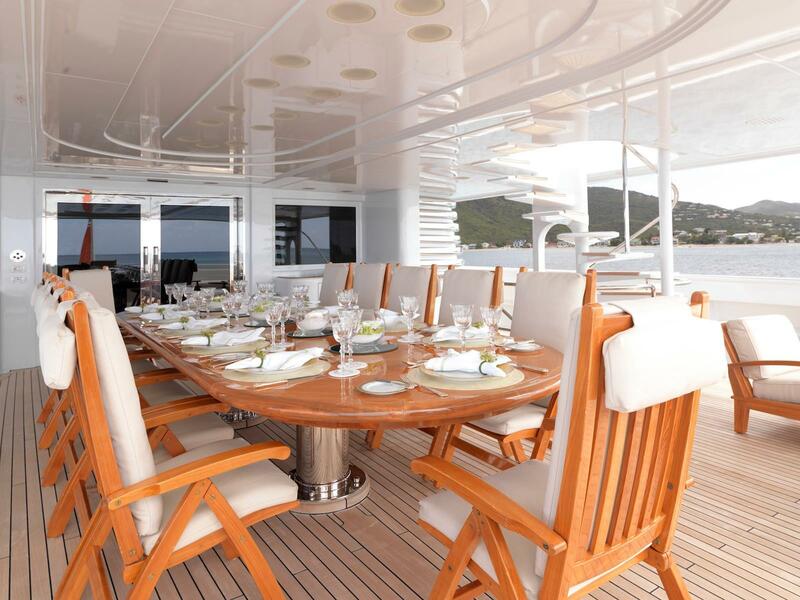 On the upper deck aft, there is a stunning alfresco dining table seating up to 10 guests for formal meals in the fresh air and sunshine. 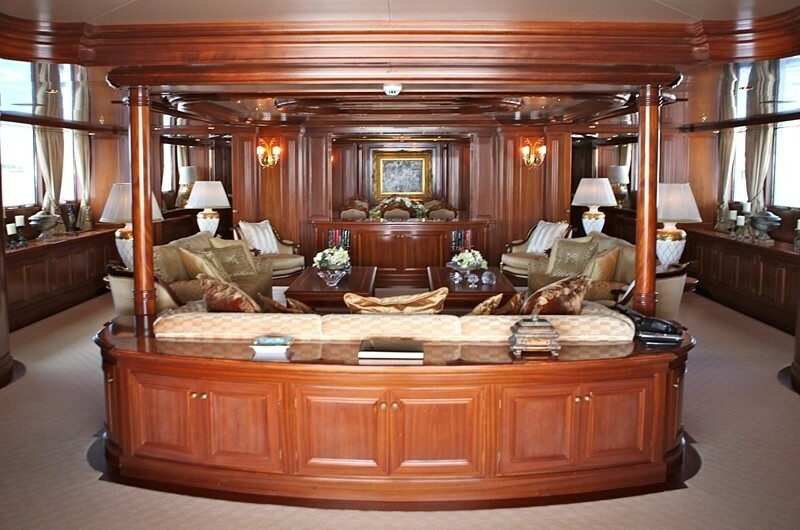 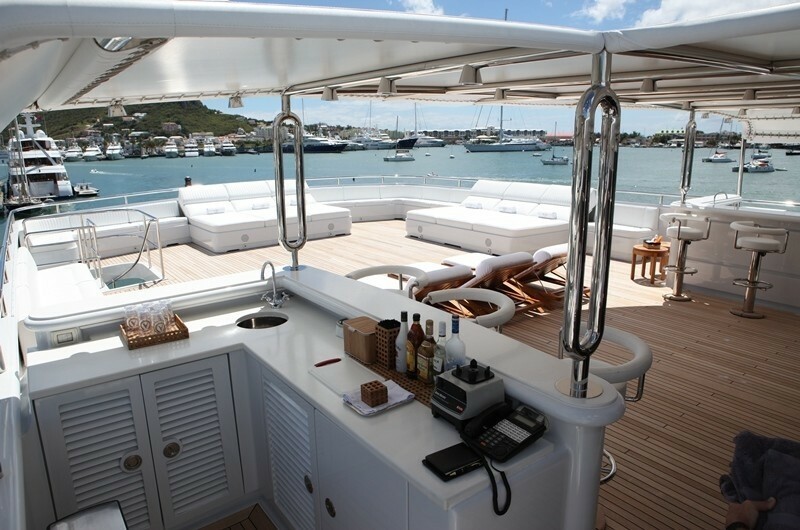 Along the stern, the seating is divided into smaller sections for more intimate conversations between guests and coffee tables provide a place to rest drinks from the nearby bar. 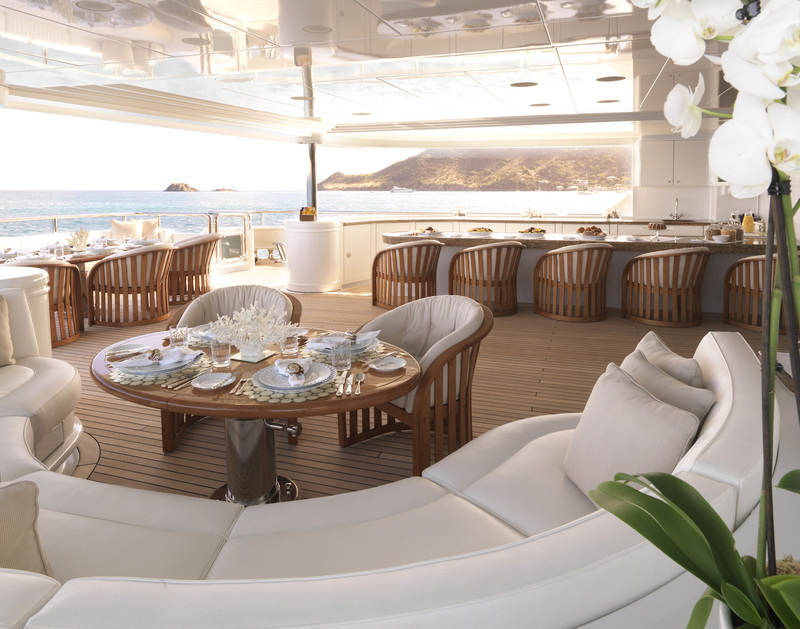 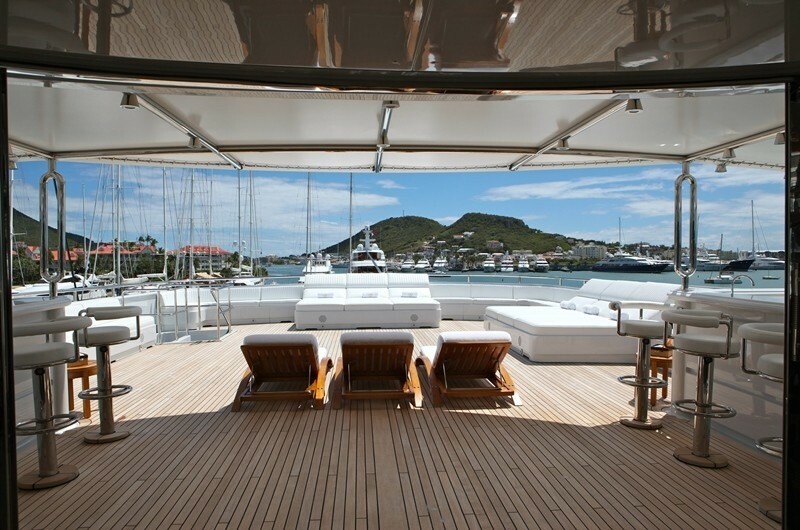 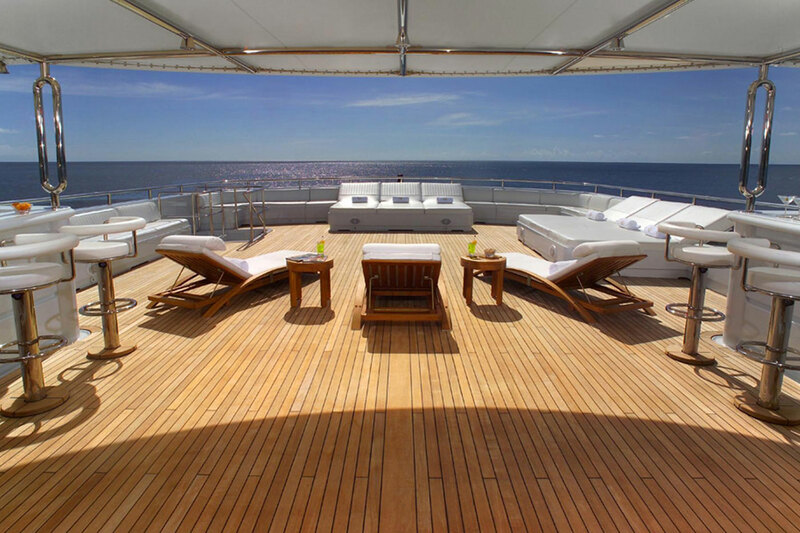 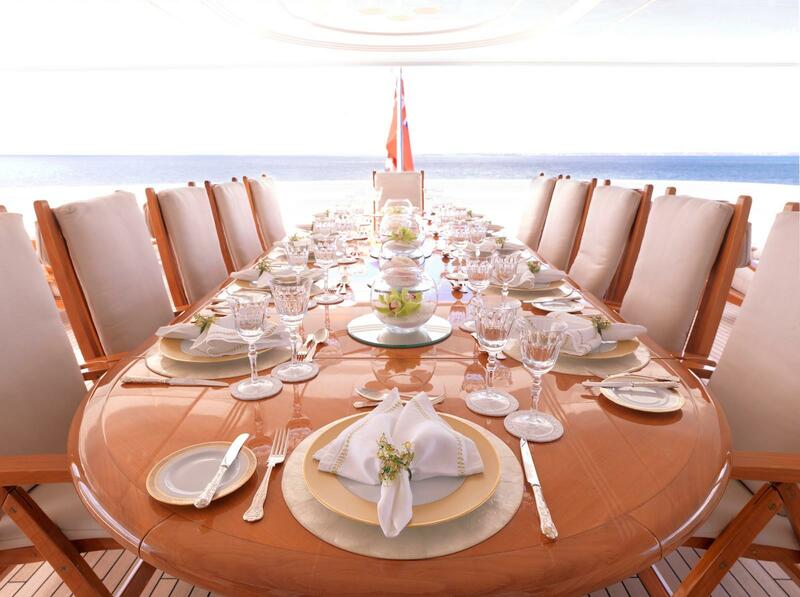 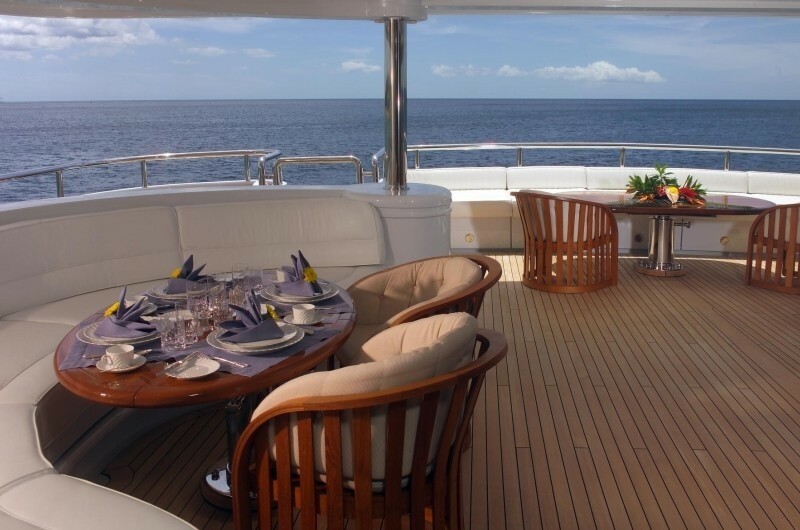 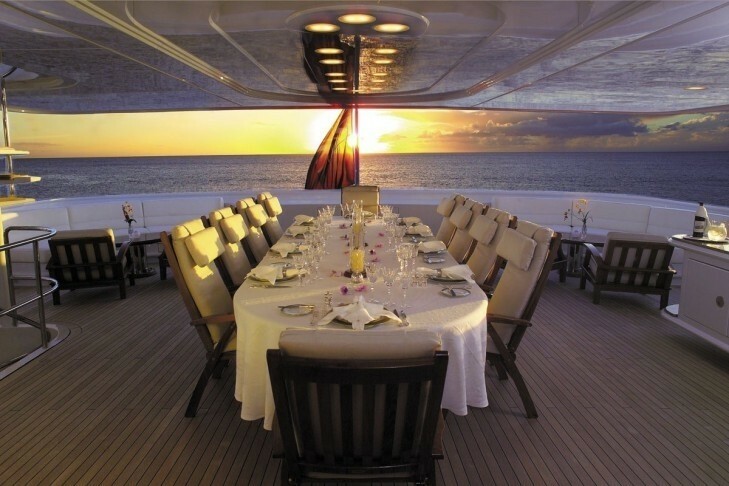 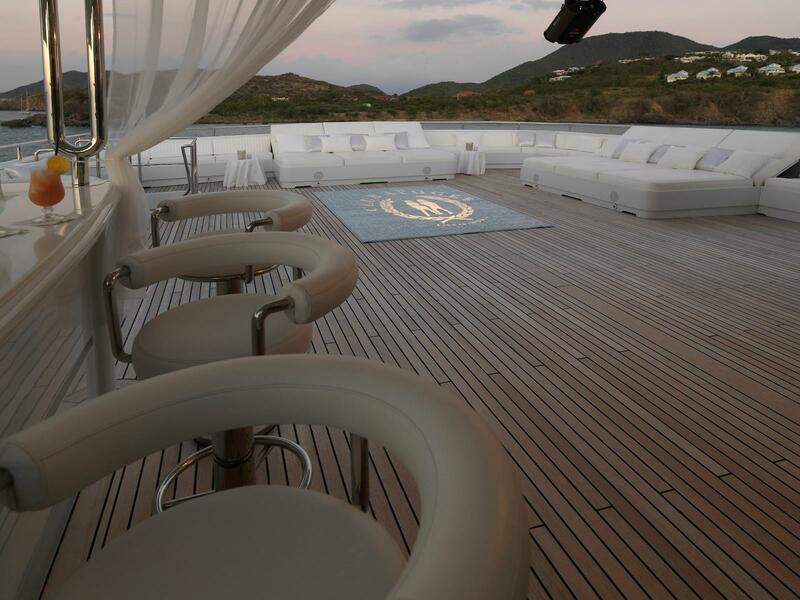 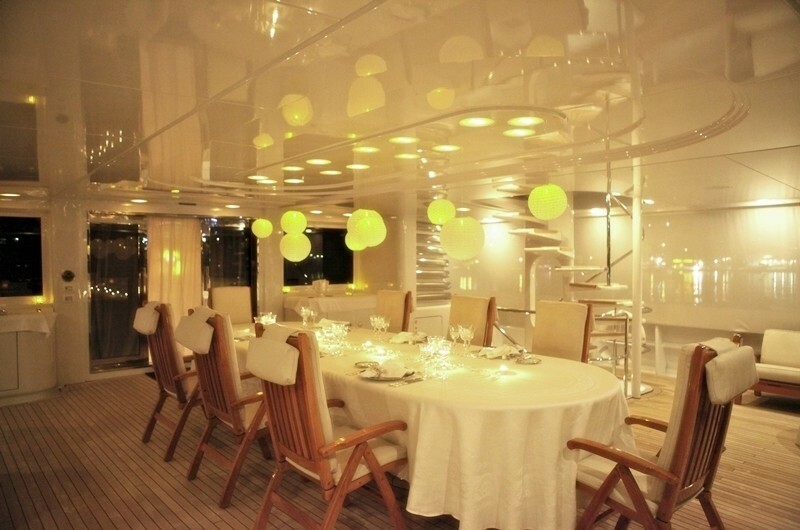 On the foredeck, the Portuguese deck hosts a circular seating area that can be converted into an additional sun pad area. 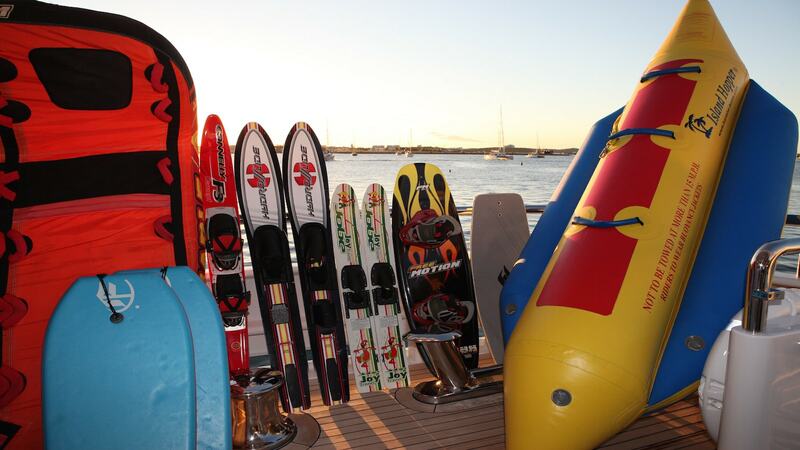 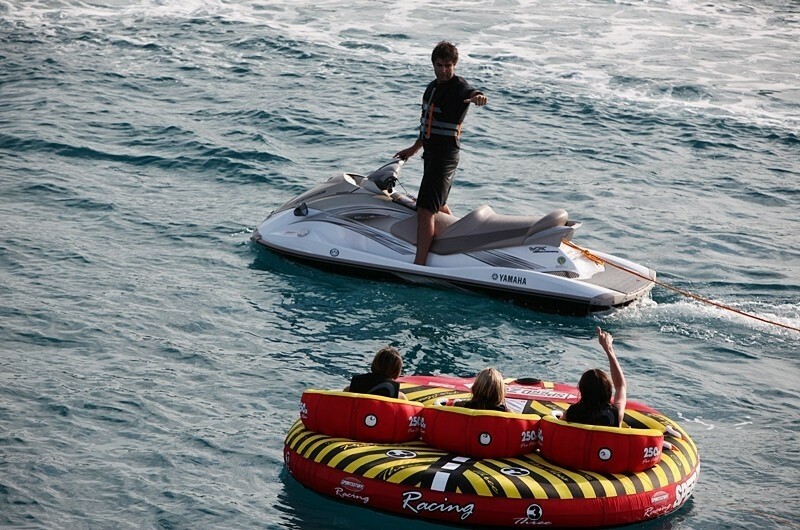 Towards the bow, there is a place to store the motorized water toys. 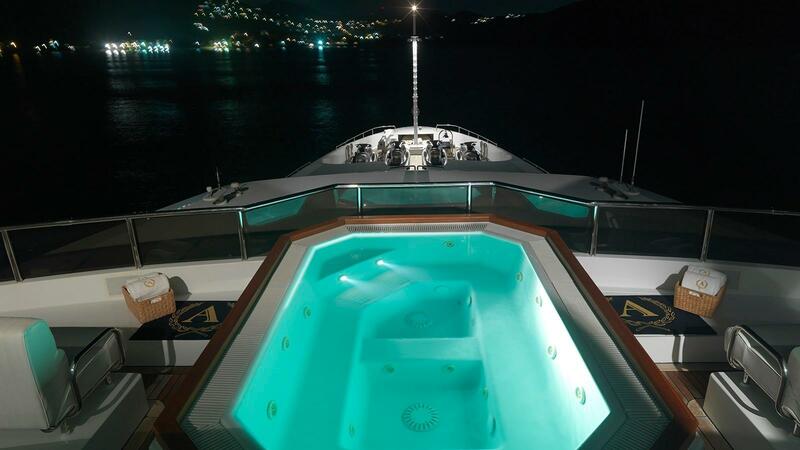 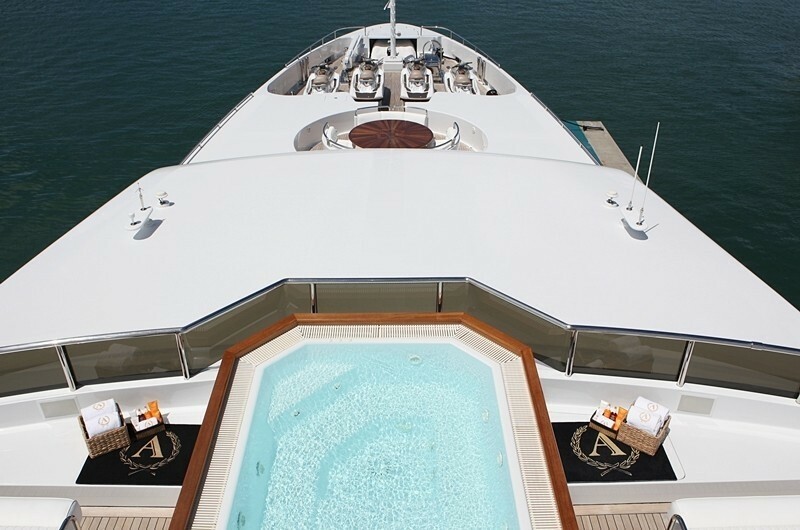 The sundeck is crowned with a beautiful Jacuzzi pool that sits between two foredeck sofas that look out over the decks below. 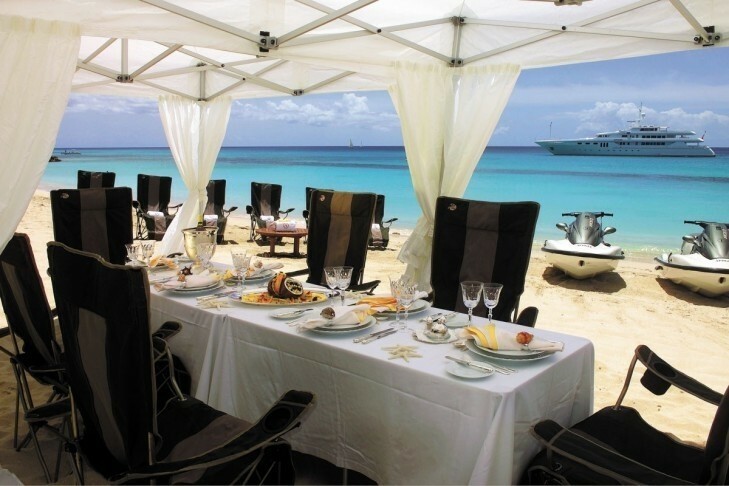 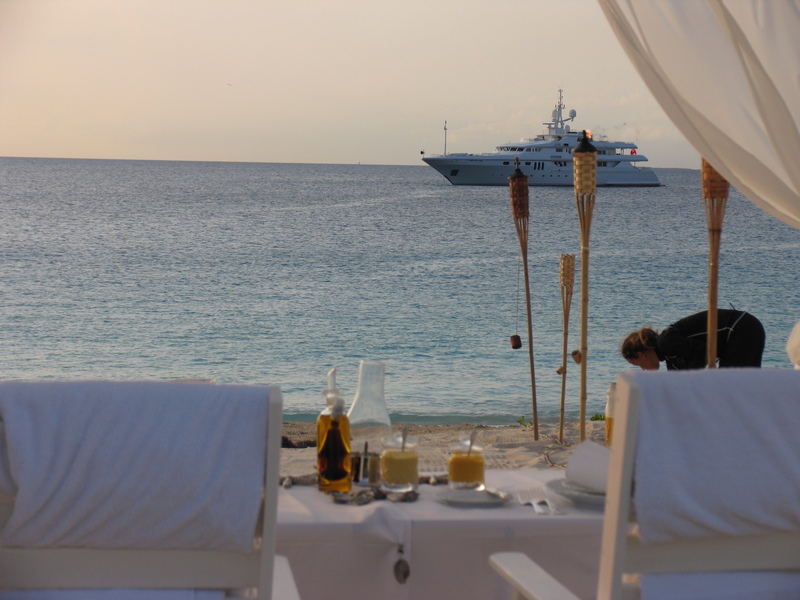 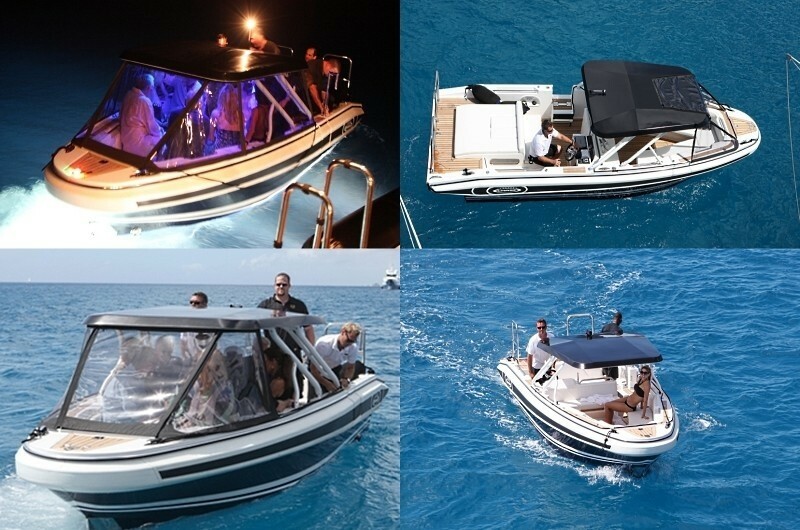 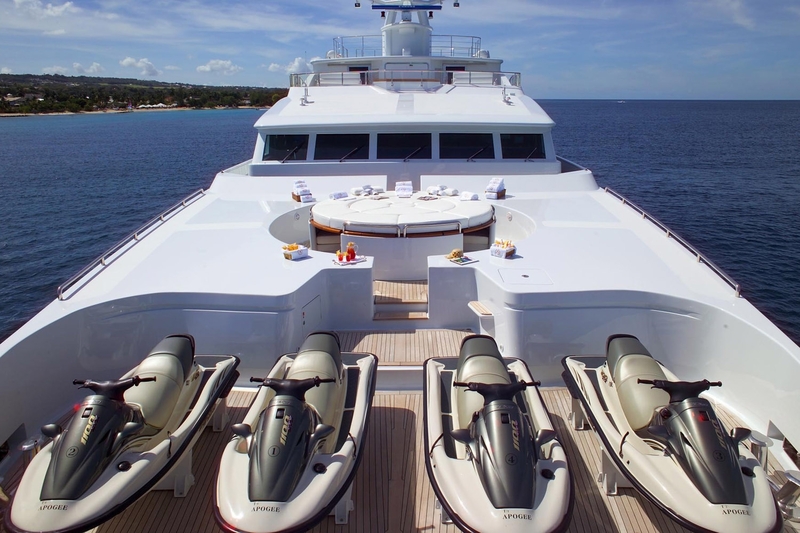 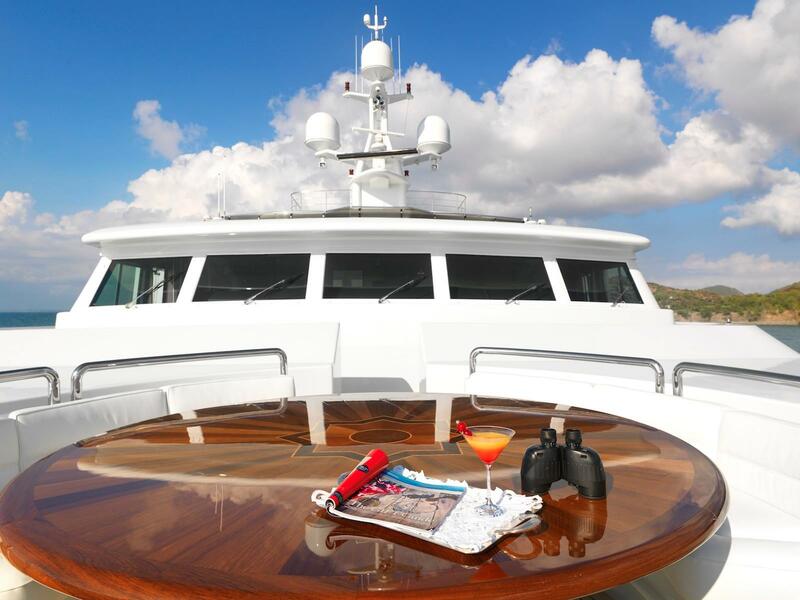 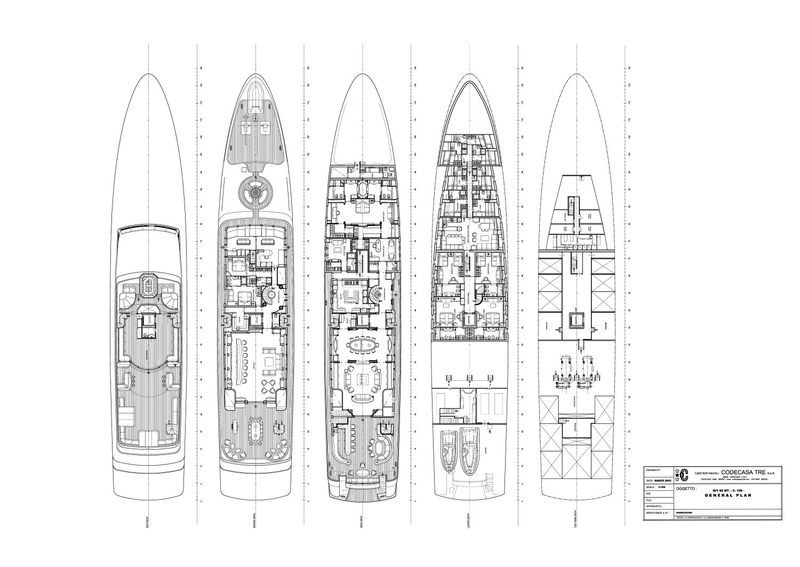 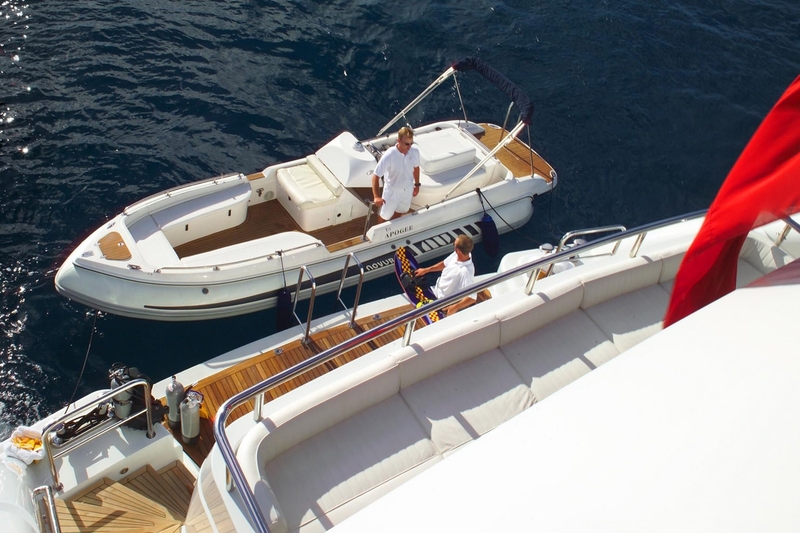 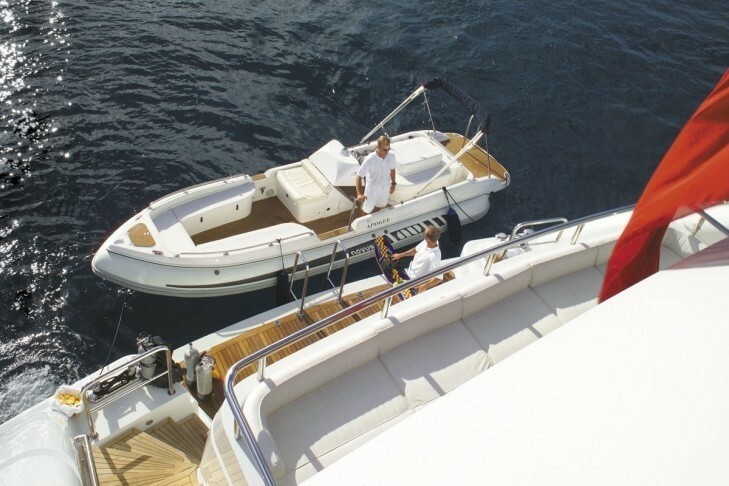 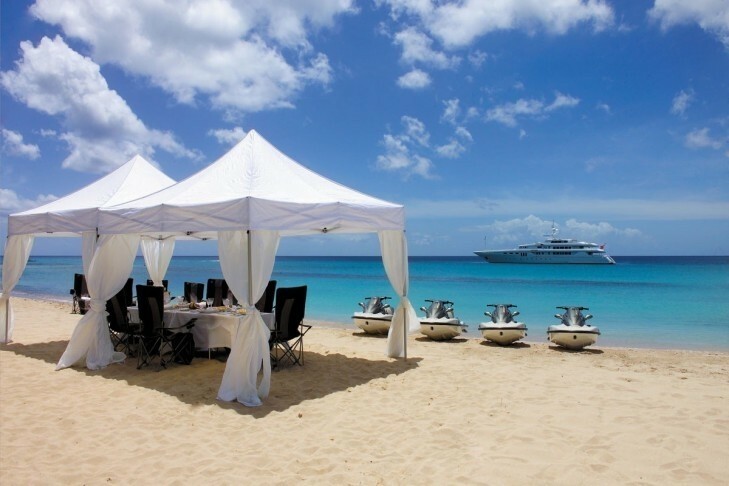 Behind, there are two bars located on the port and starboard sides that enjoy the shade of the central hardtop, while the sun-exposed aft has plenty of sunpads and sun loungers around the outsides with the central area left clear for exercise and parties. 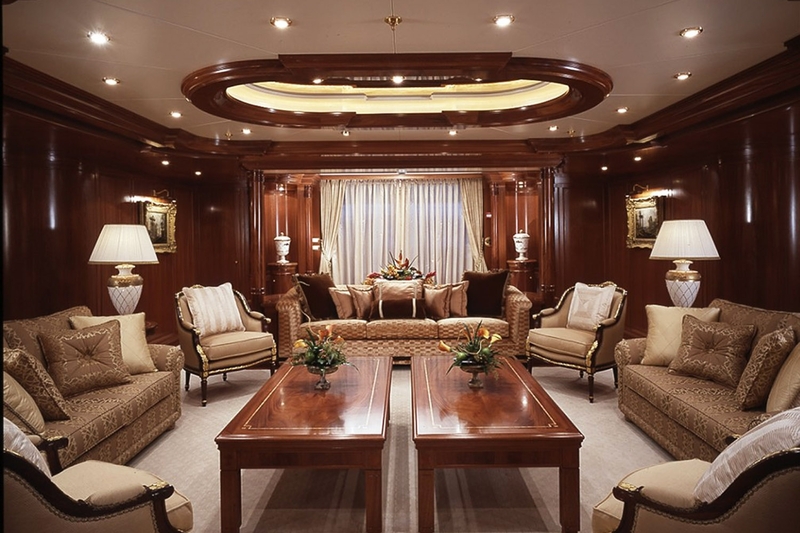 The classically-styled main salon makes an excellent first impression using high-quality mahogany paneling and furnishings against white carpets and cream and brown upholstery. 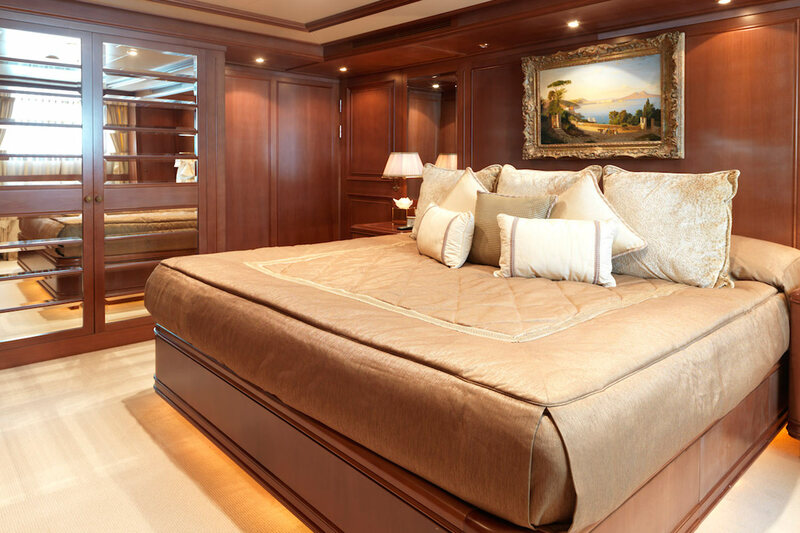 Large windows ensure that there is plenty of light and excellent views throughout the day and the curtains can be drawn for extra privacy. 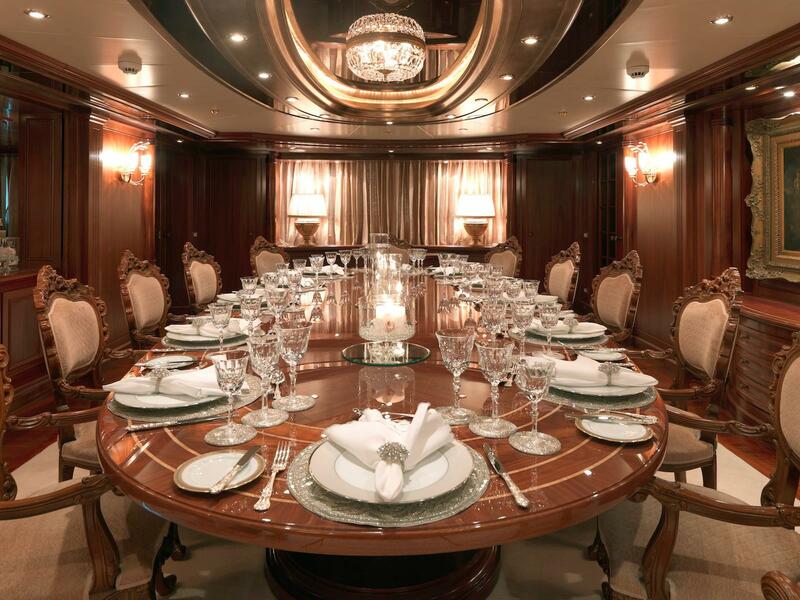 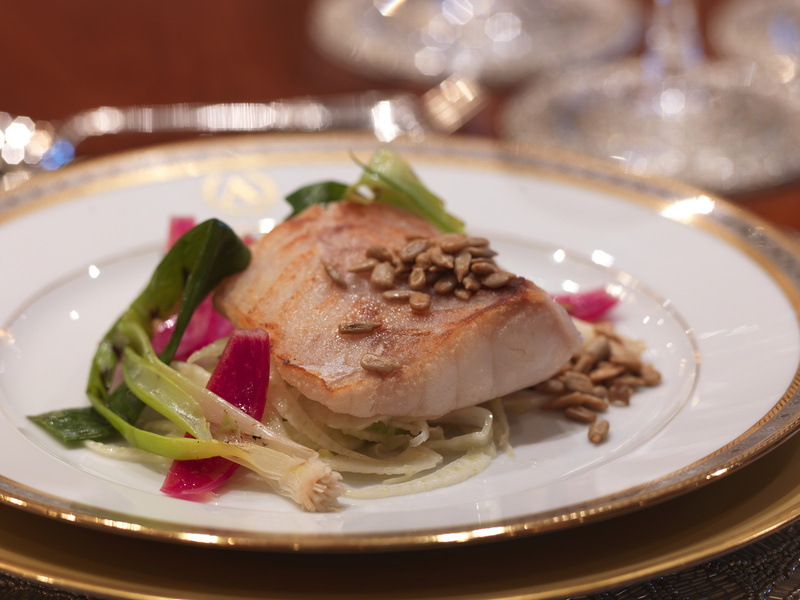 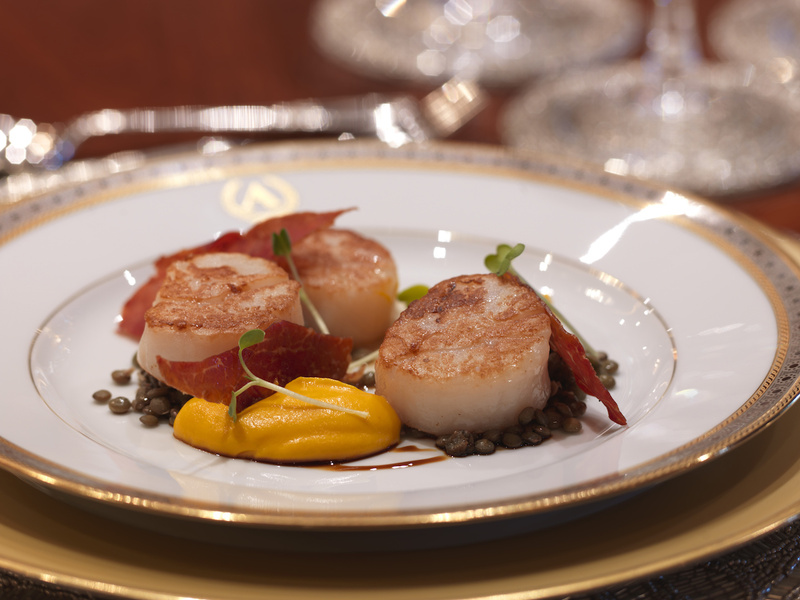 Guests can converse in comfort while waiting for dinner at the lavish forward formal dining table which is separated from the salon by a partition. 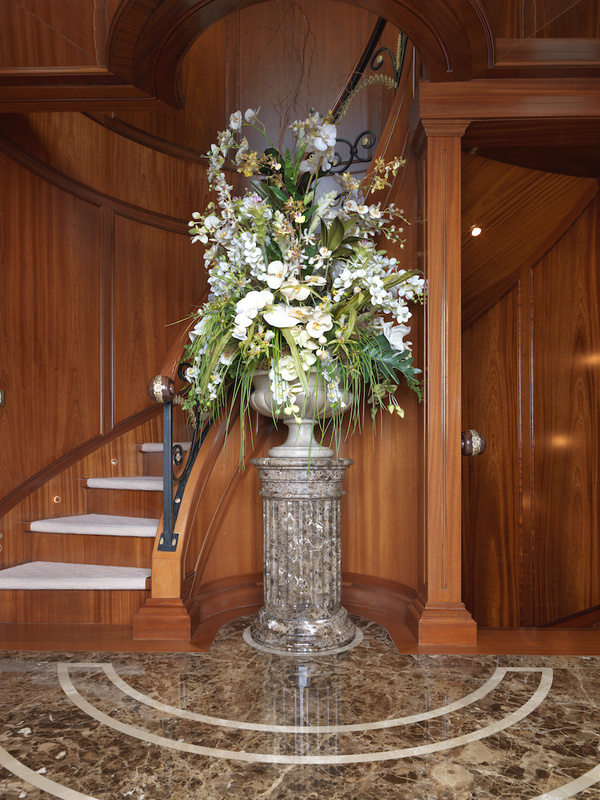 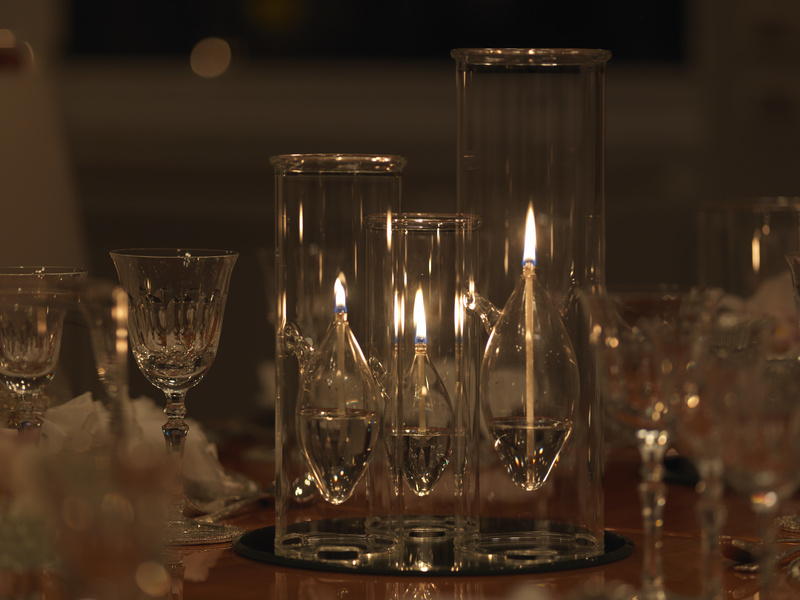 Artwork and decorative wall sconces add to the ambiance of your celebration, and the lighting can be dimmed or brightened as required. 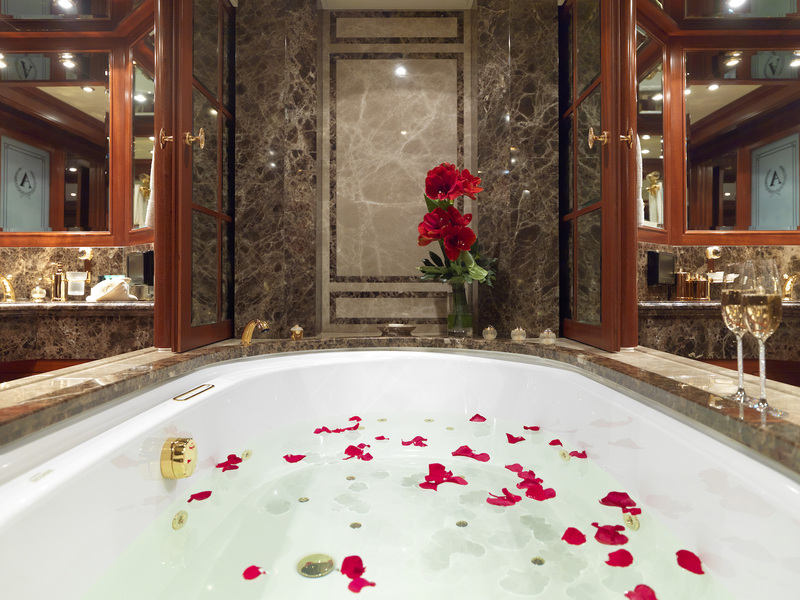 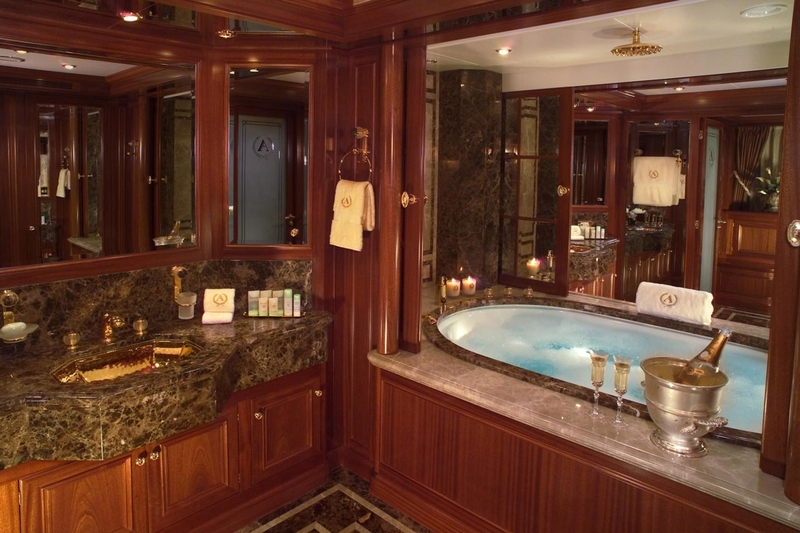 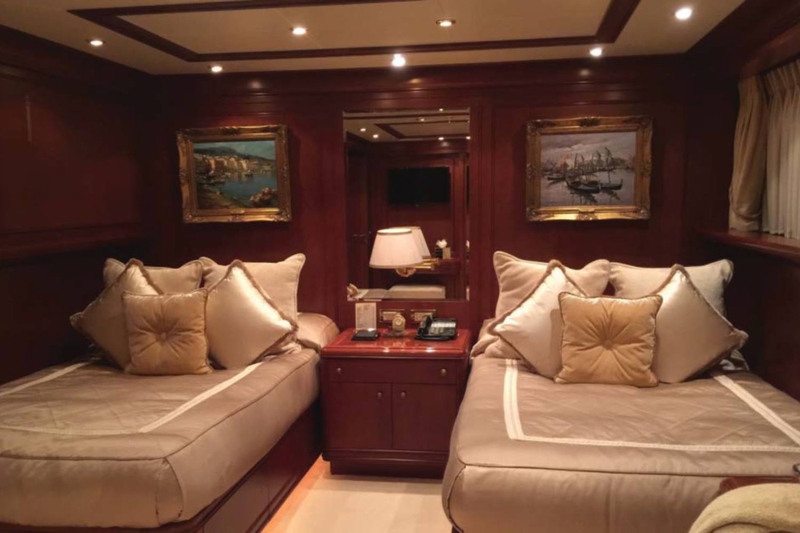 One of the double guest cabins and the Master suite is located forward of the main foyer, and the latter offers a generous salon, his and hers bathrooms, a walk-in wardrobe and a private office/study. 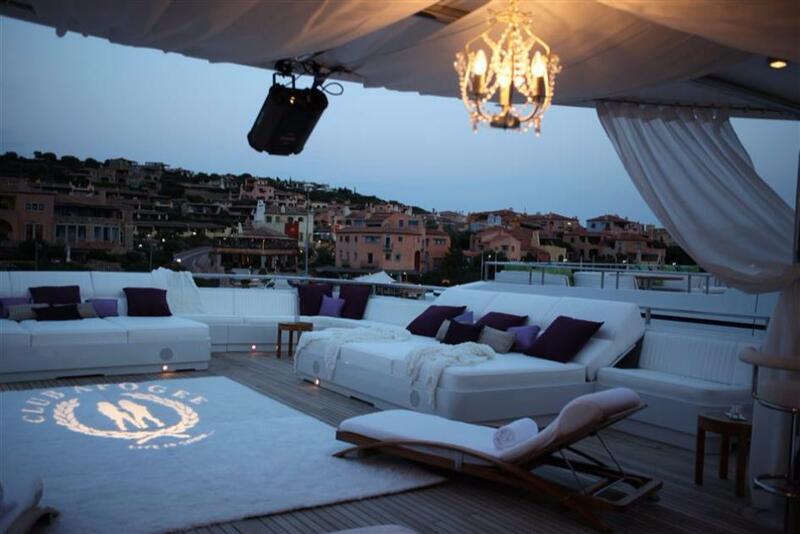 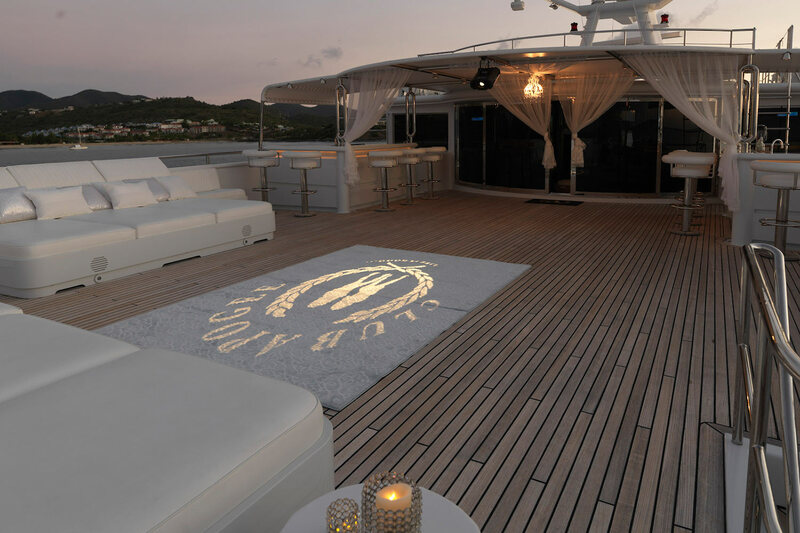 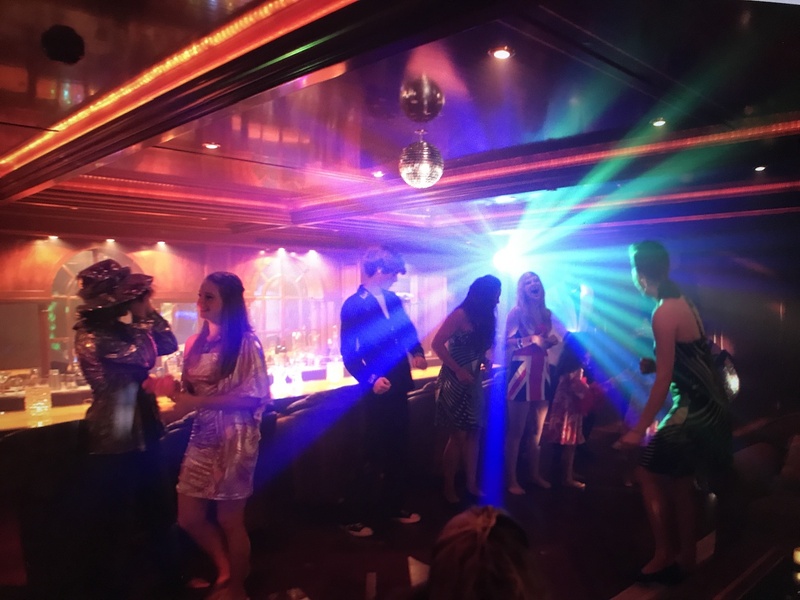 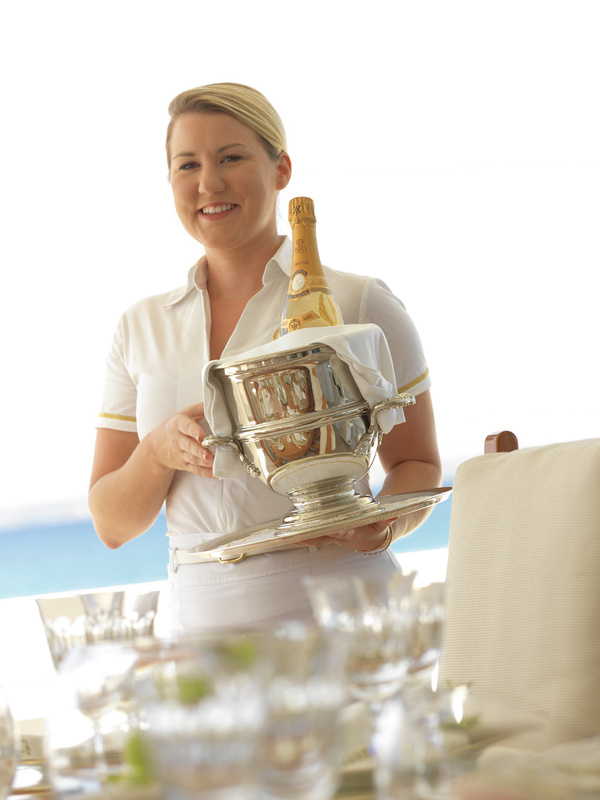 Designed for entertaining large numbers of guests while dockside, the glamorous skylounge has an extensive bar that will seat up to seven party-goers. 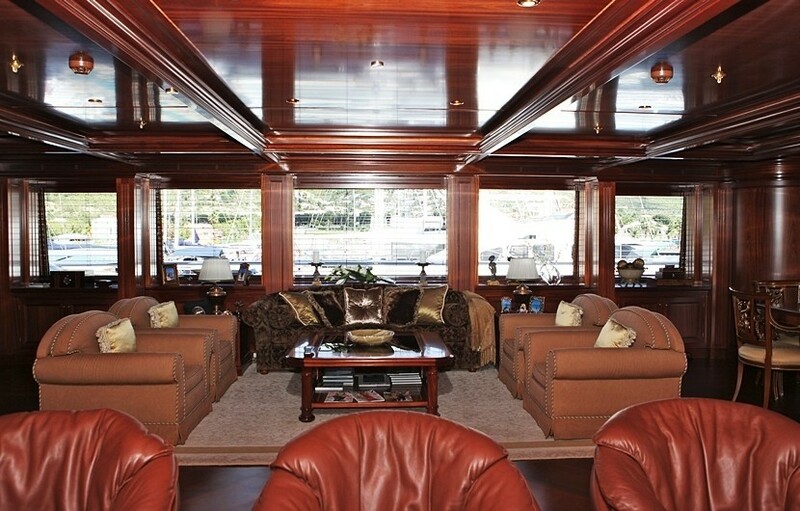 Beside the windows on the adjacent side, there is a sofa and armchairs surrounding a coffee table for cozy conversations and quiet relaxation during the day. 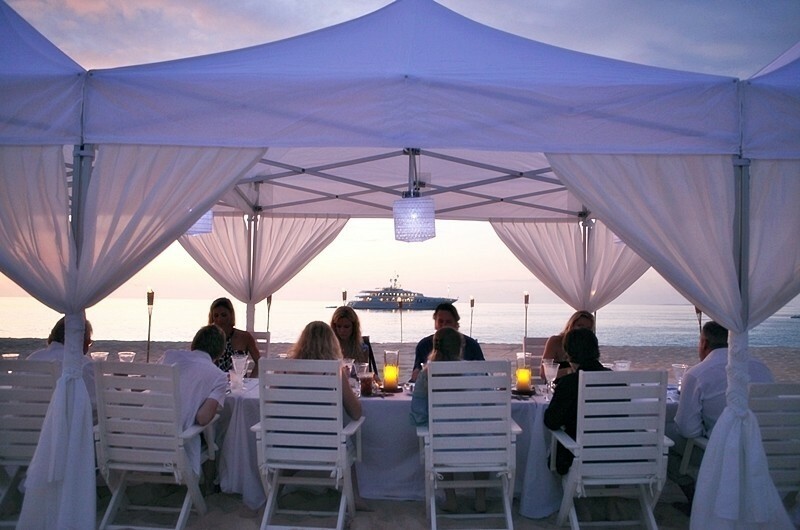 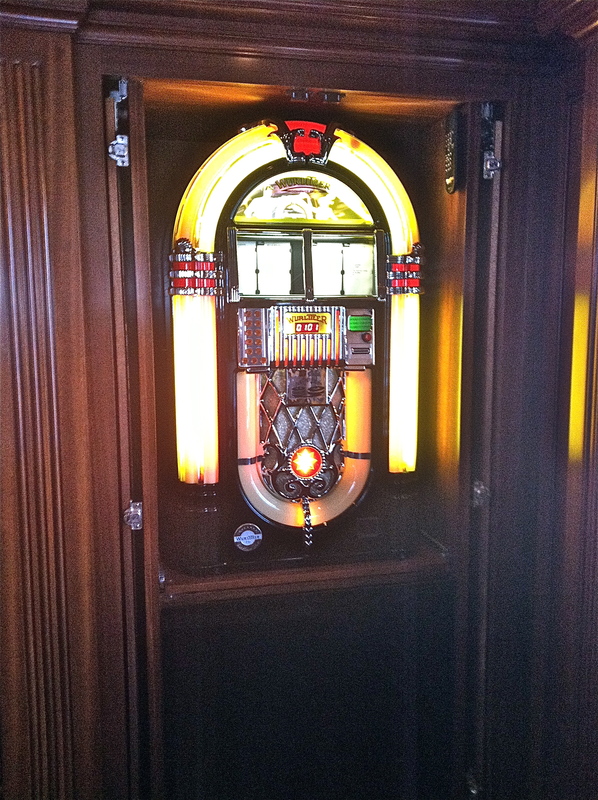 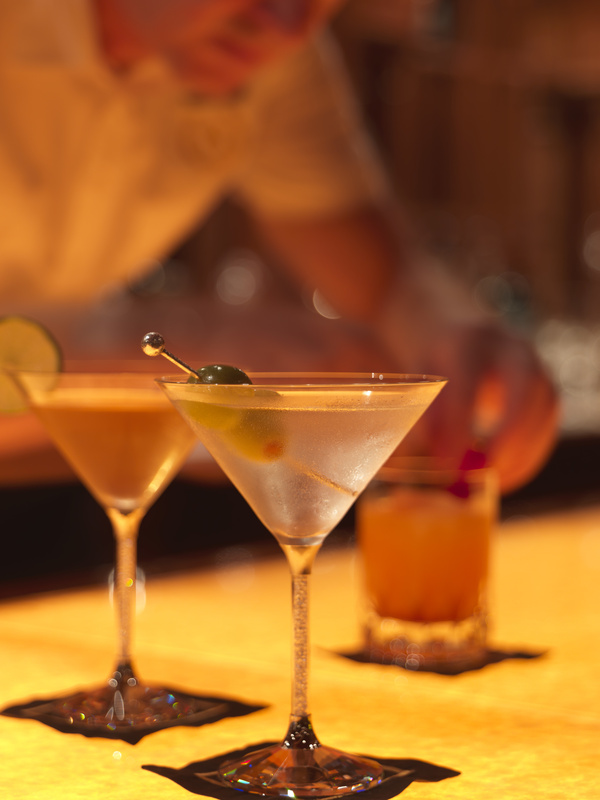 A games table and a jukebox complete the amenities for a night of revelry. 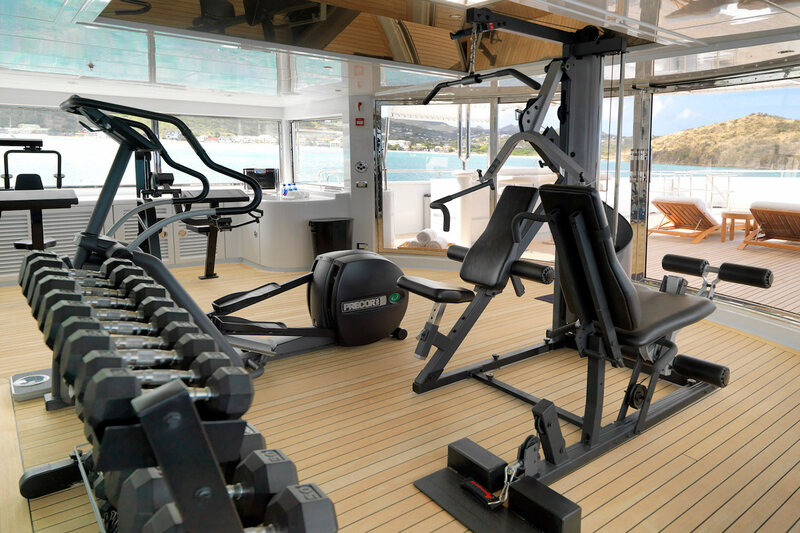 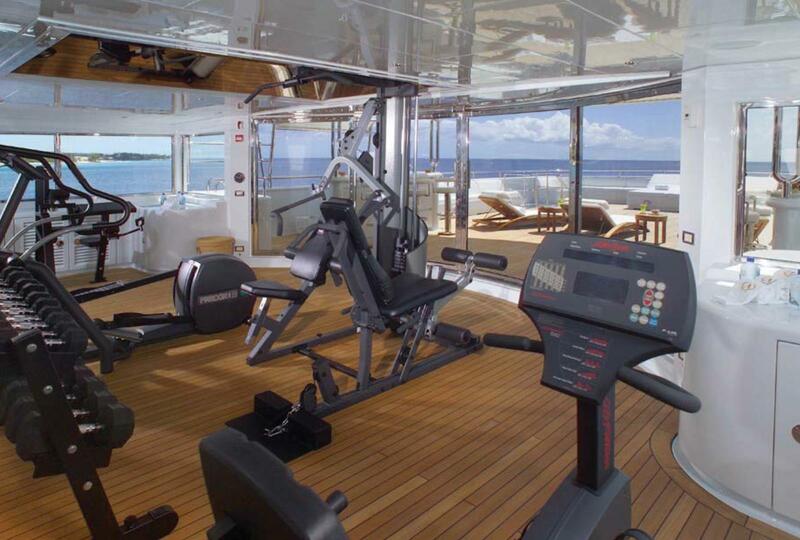 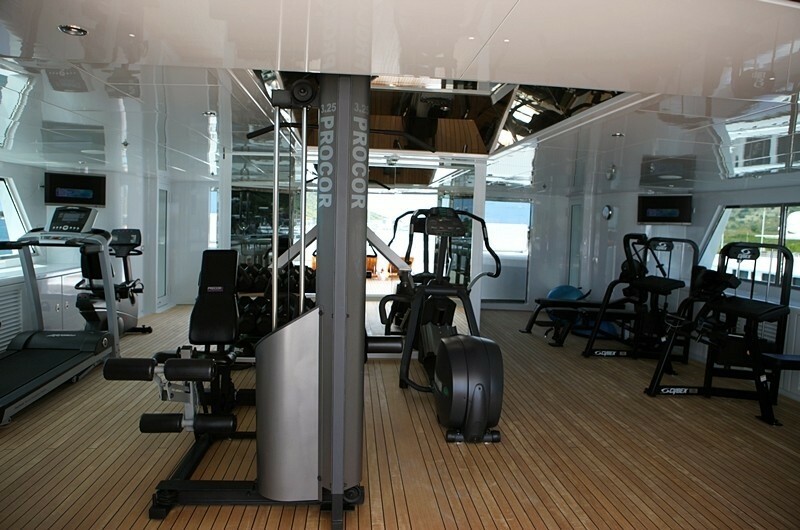 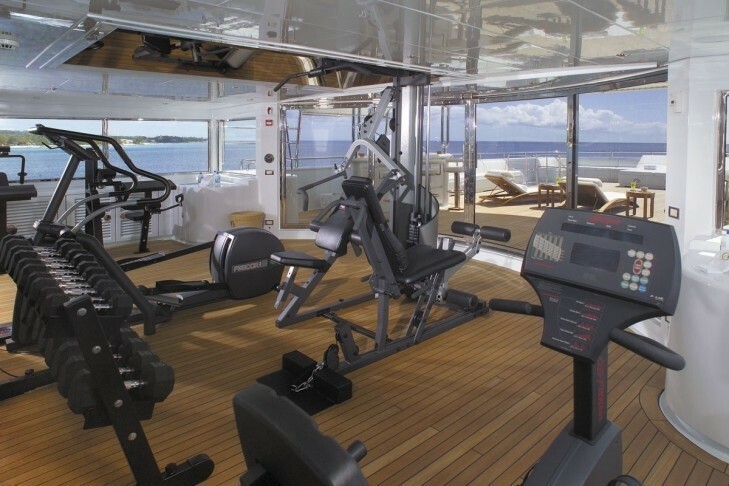 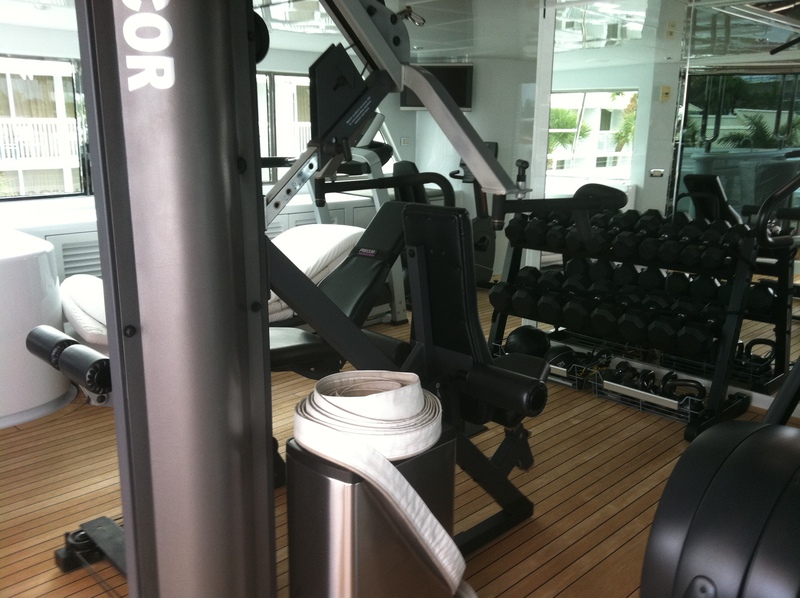 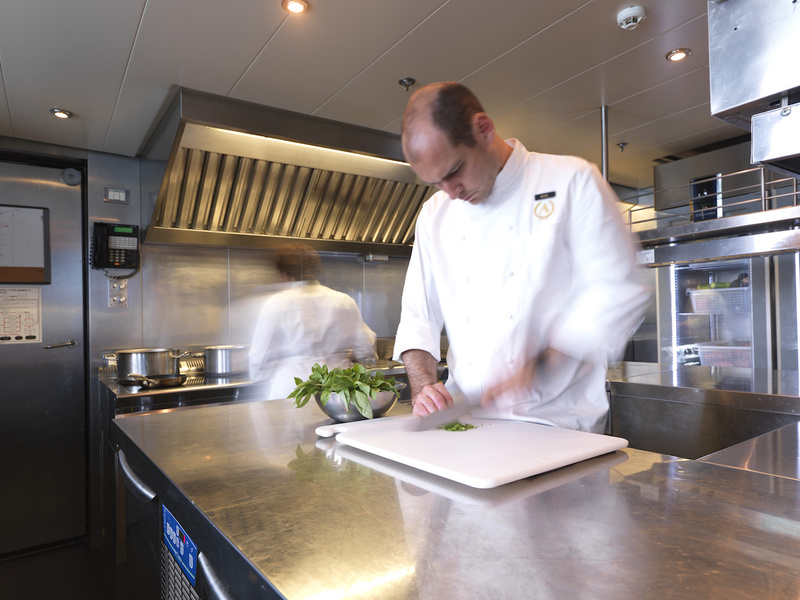 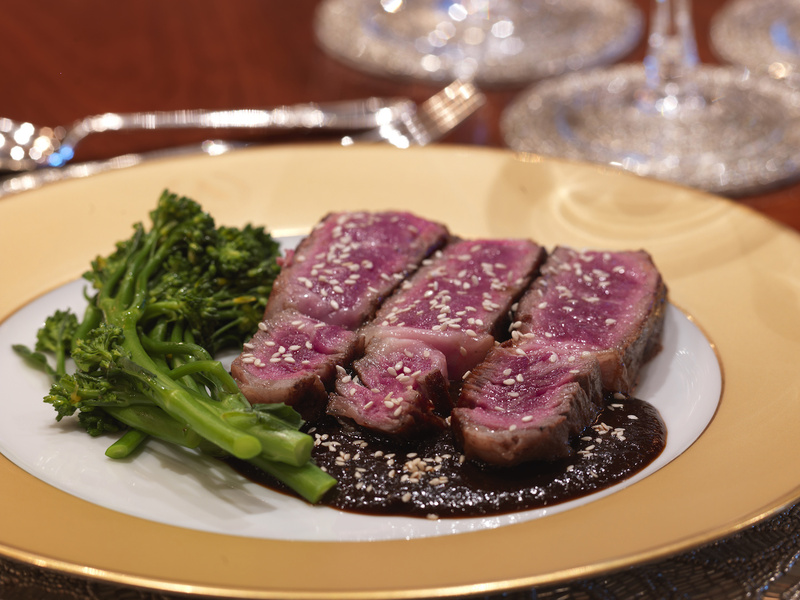 On the sundeck, the forward and aft decks are separated by the indoor gym, which has a comprehensive range of equipment for guests to maintain a fitness regime while in transit. 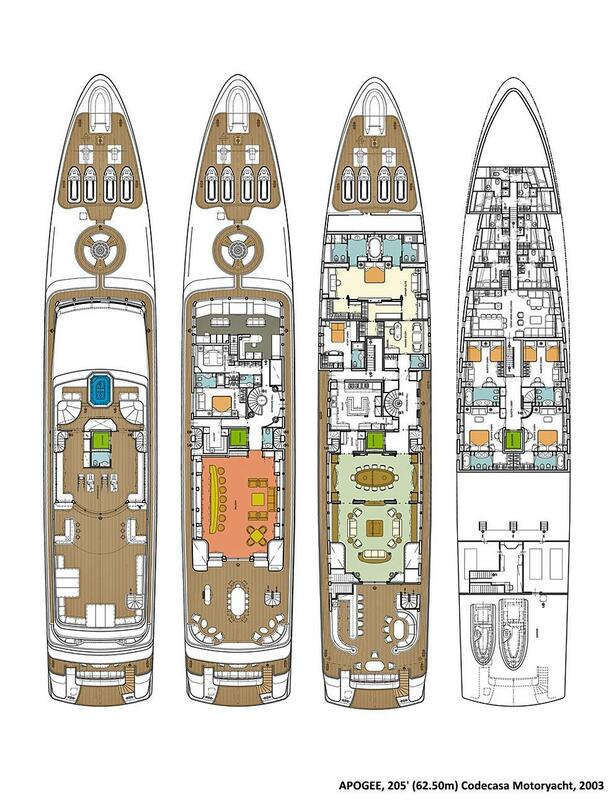 2 Caterpillar 3516B engines provide a total of 2260 HP at 1600 RPM for a maximum speed of 17.5 knots and a cruising speed of 14 knots with a range of 6,000 nautical miles. 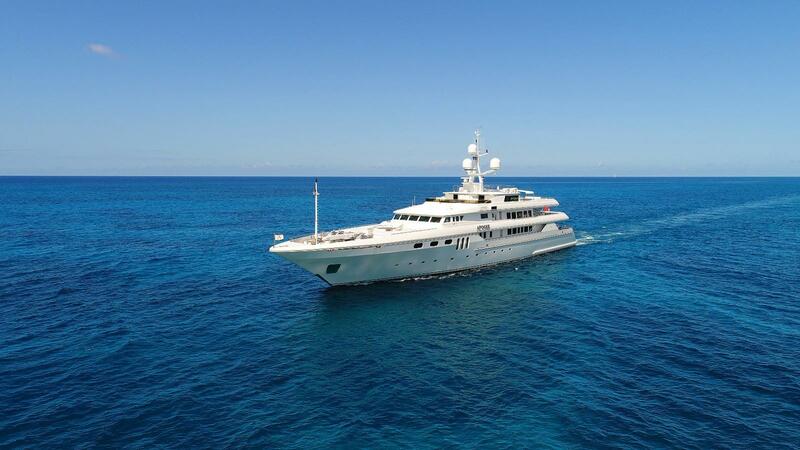 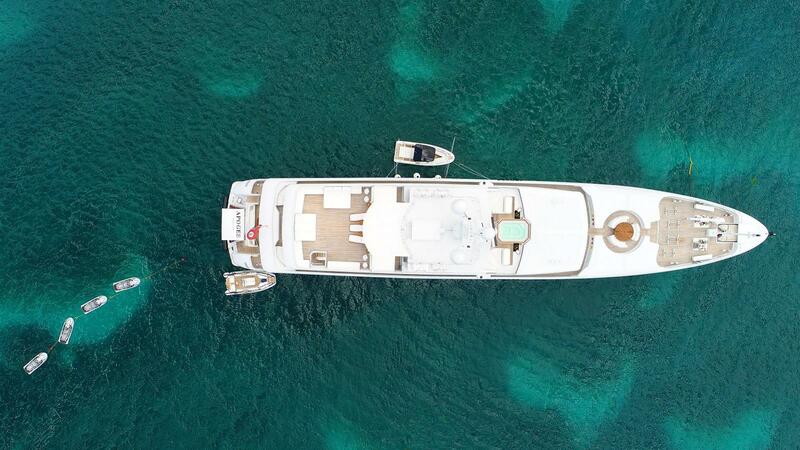 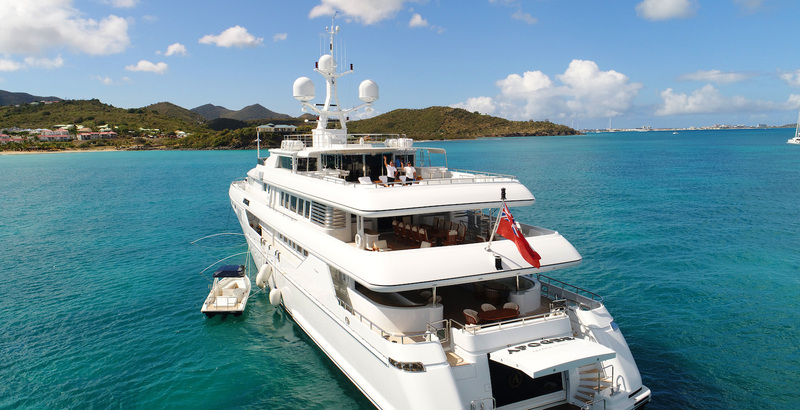 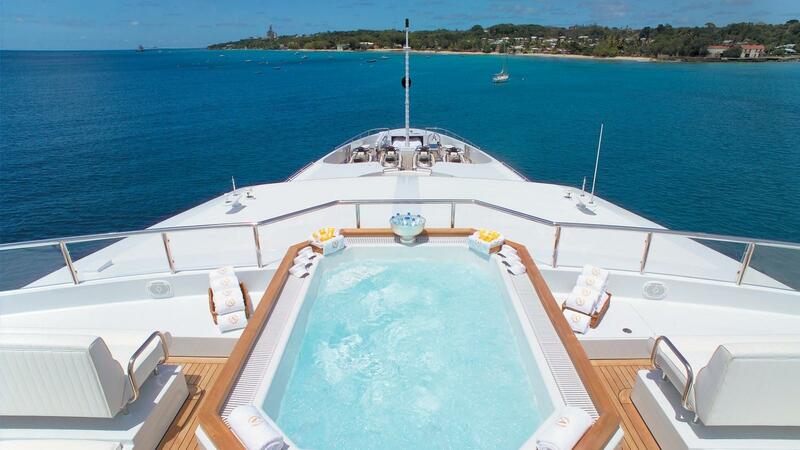 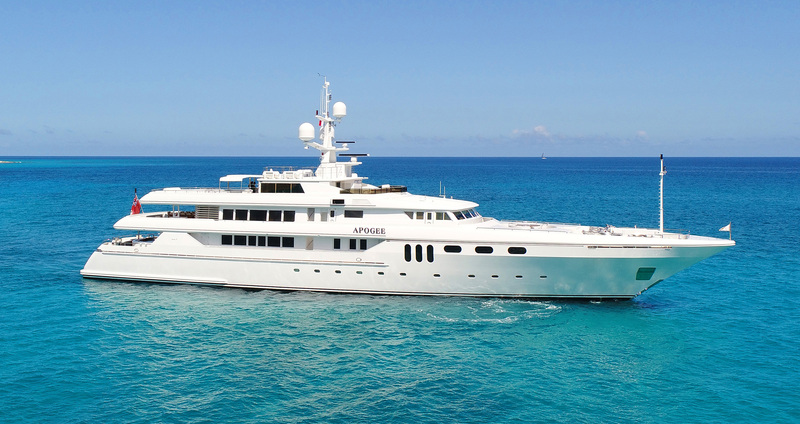 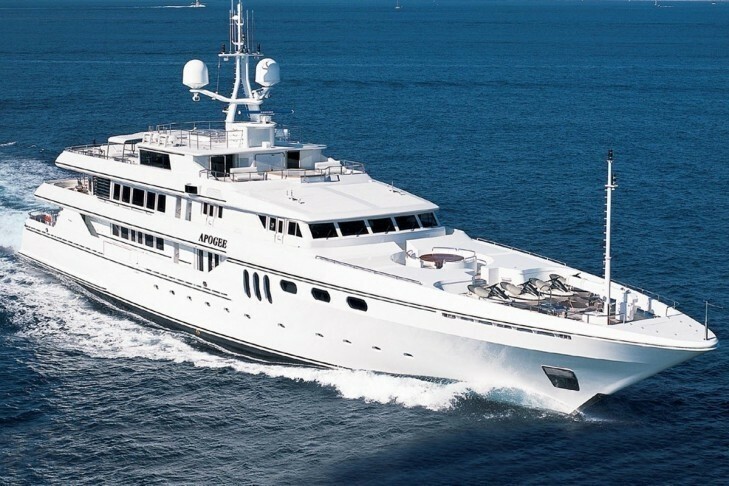 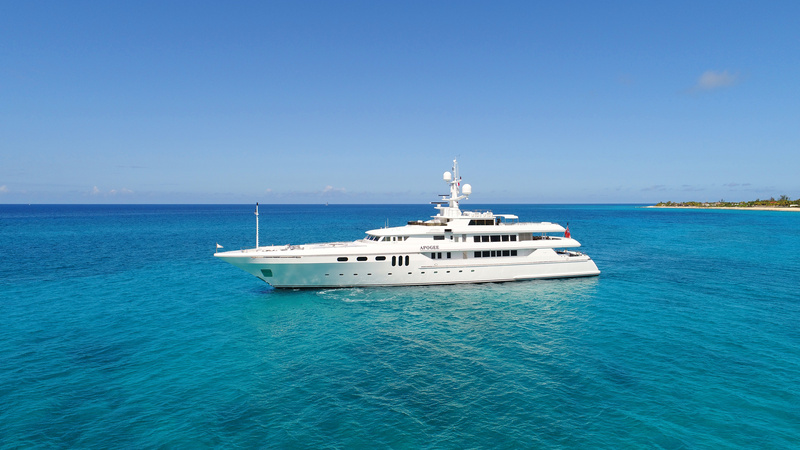 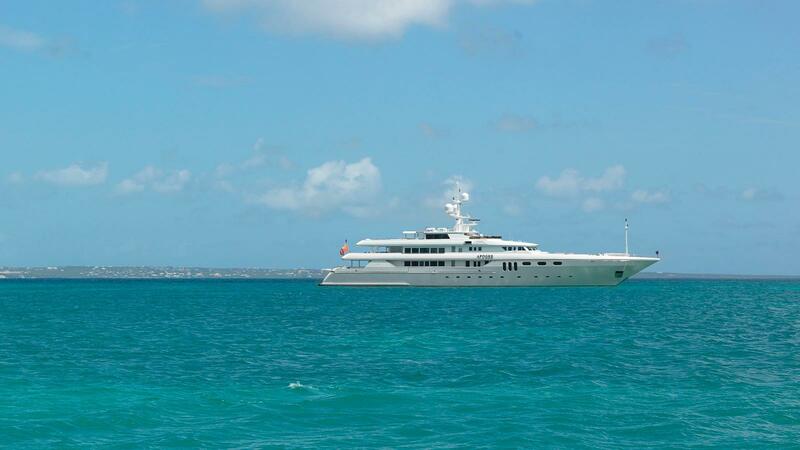 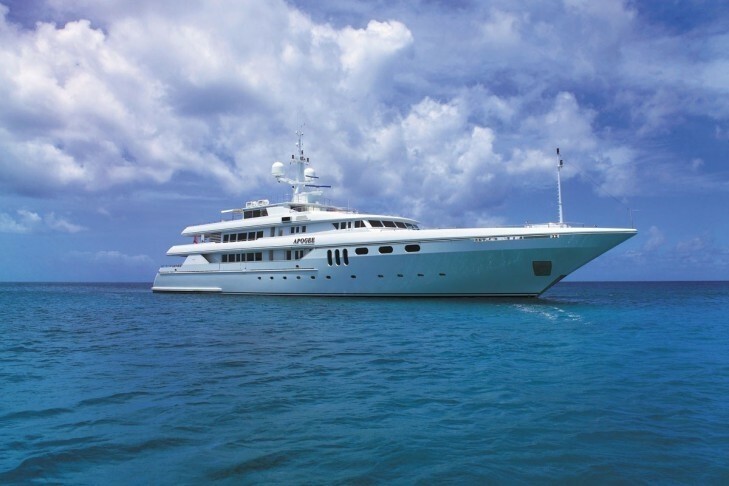 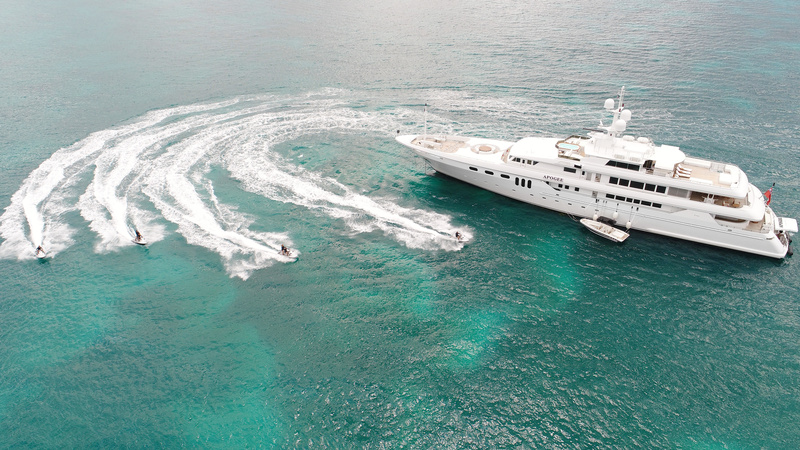 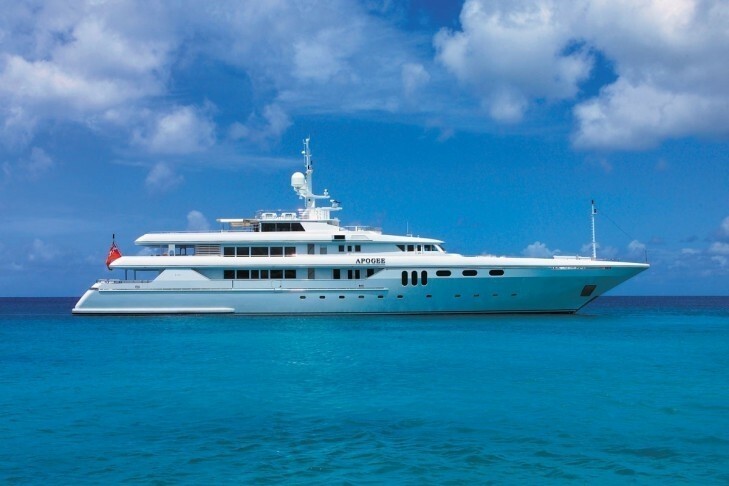 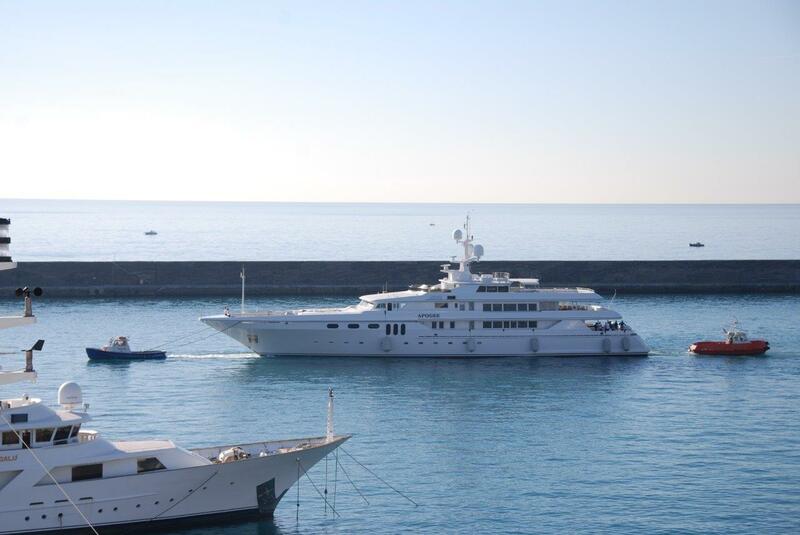 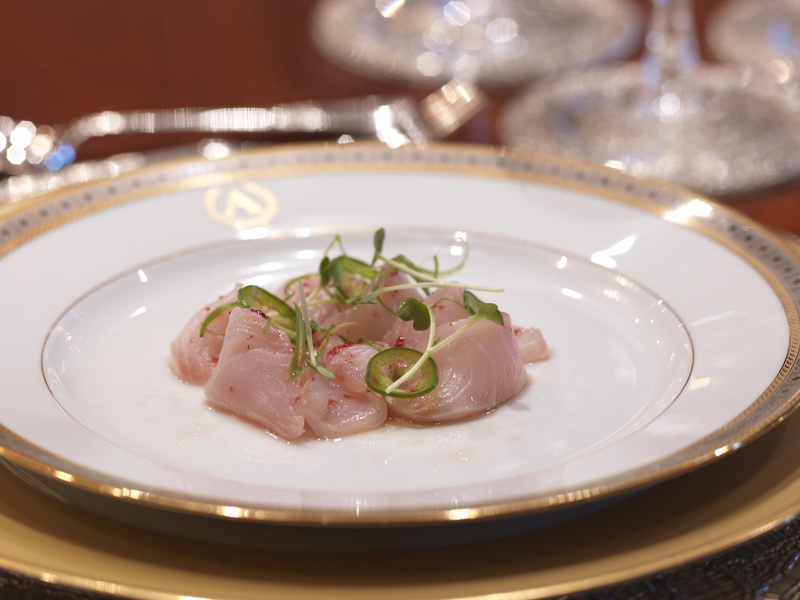 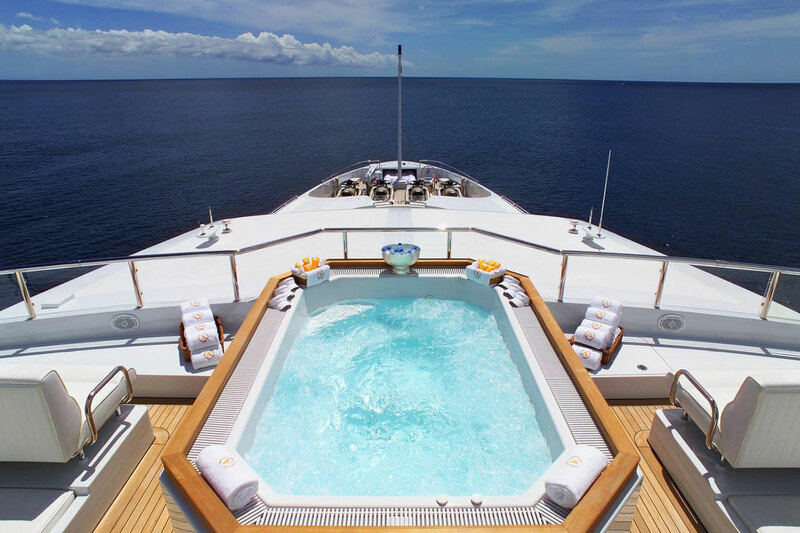 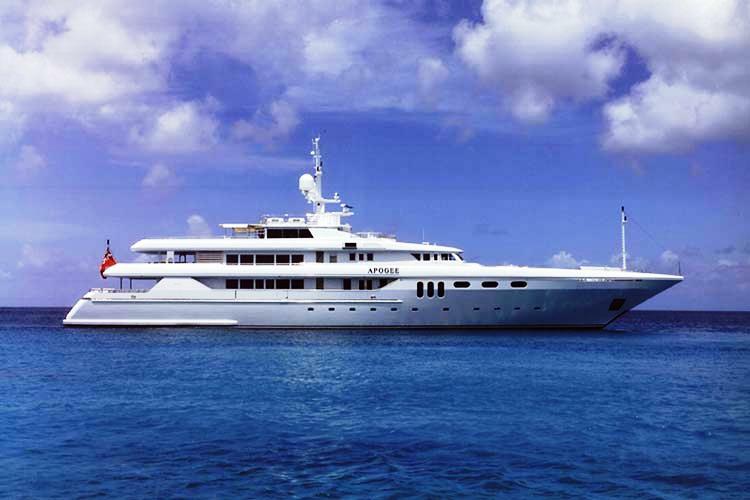 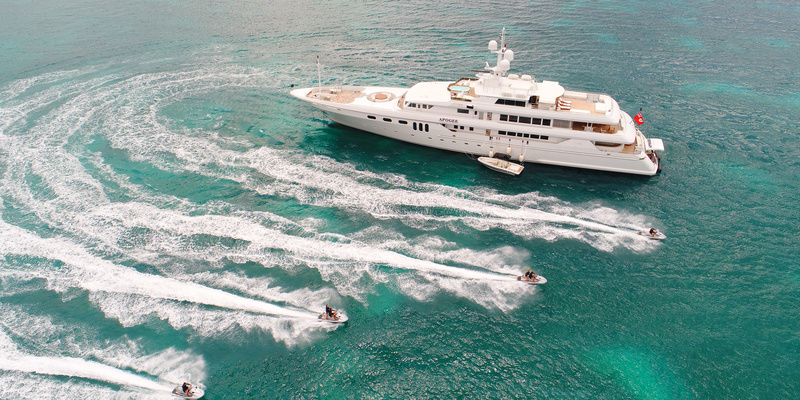 Luxury motor yacht 'Apogee' provides the spacious accommodation for a maximum of 12 guests in the following format: Her main master stateroom is full yacht width and is well positioned on the main deck. 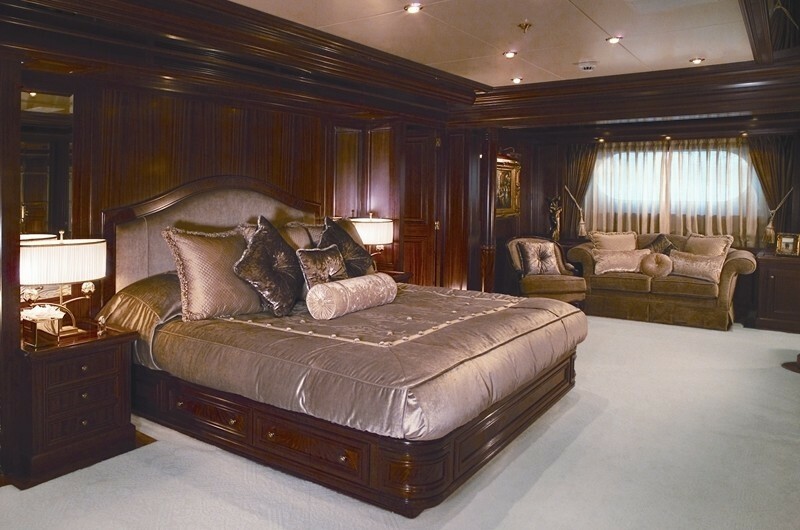 The master has a king sized bed, a his & hers en-suite bathroom with a Spa Pool tub, as well a walk in closets, a settee, and adjoining study or office and a safe. 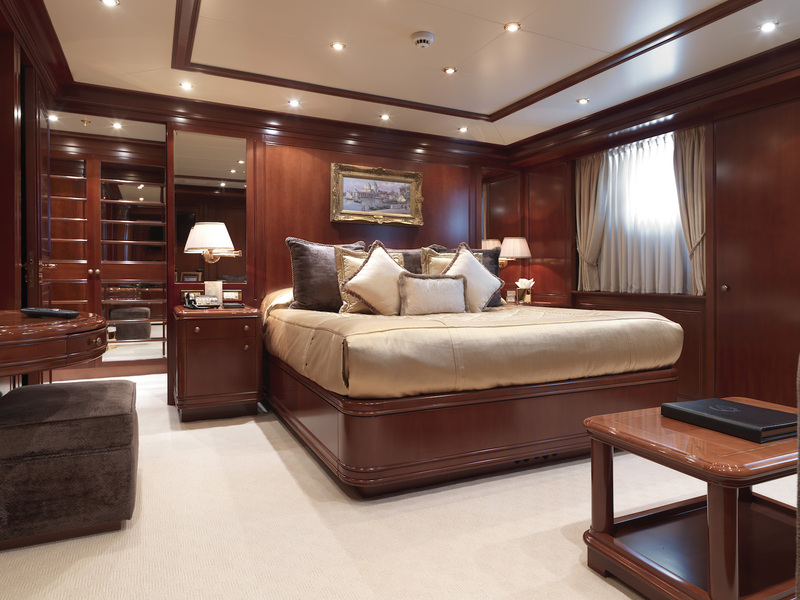 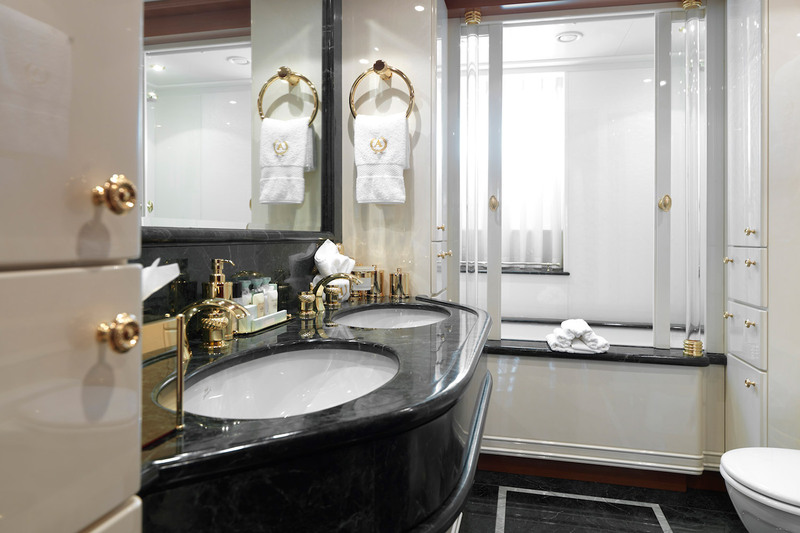 There is a Main deck Guest stateroom with a pull out double sofa bed with two Pullman bunks, a walk-in closet and en-suit bathroom. 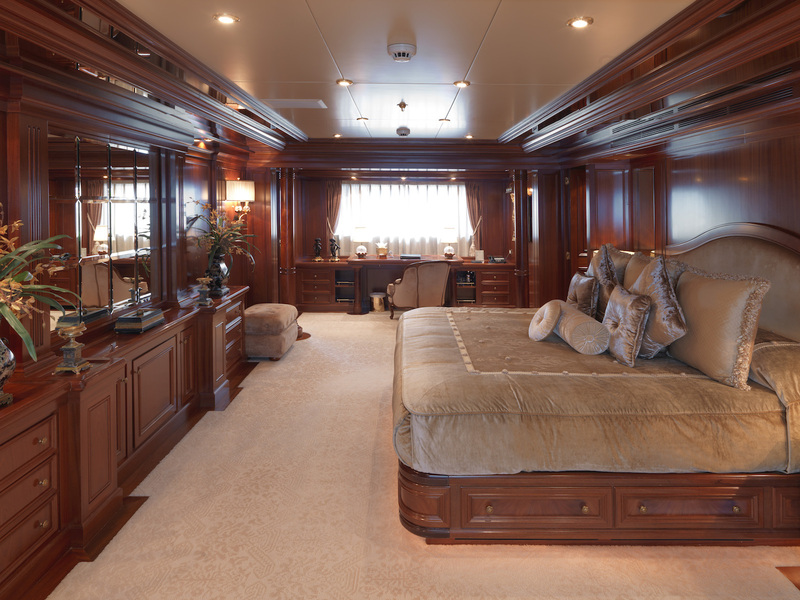 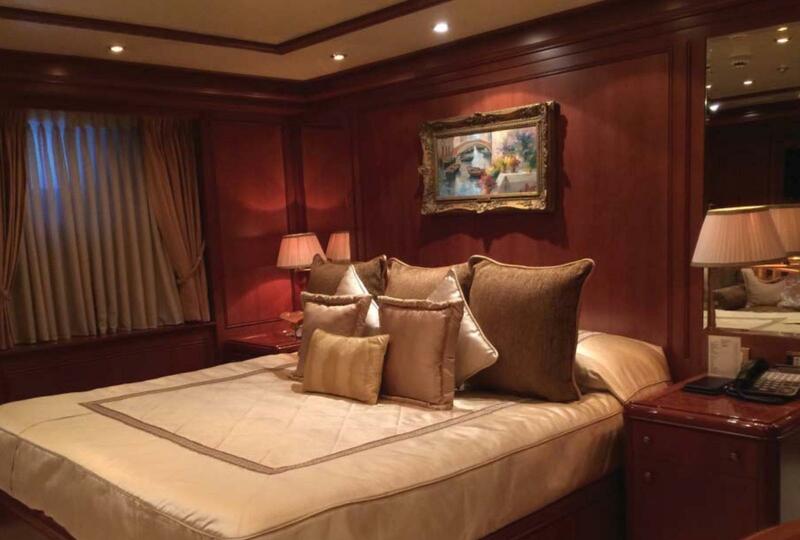 Two Guest staterooms below deck with Queen sized beds, and ensuite bathrooms with his & hers sinks, bathtub, walk in closets and settees. 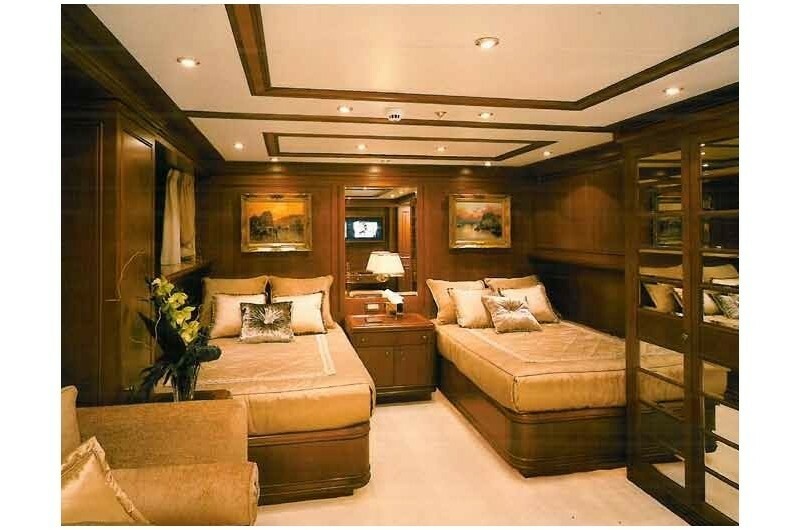 Two further Guest staterooms below deck with twin size beds with Pullman bunks, settees, en-suite bathroom with his & hers sinks and bathtubs. 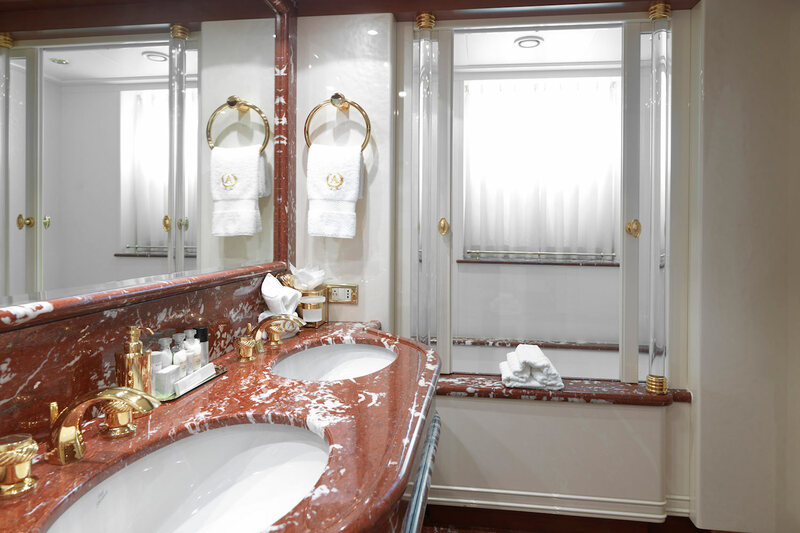 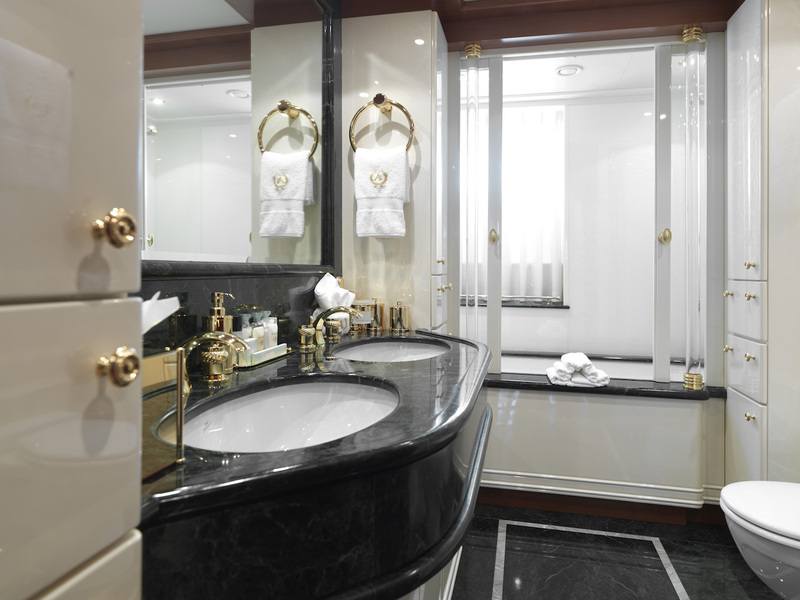 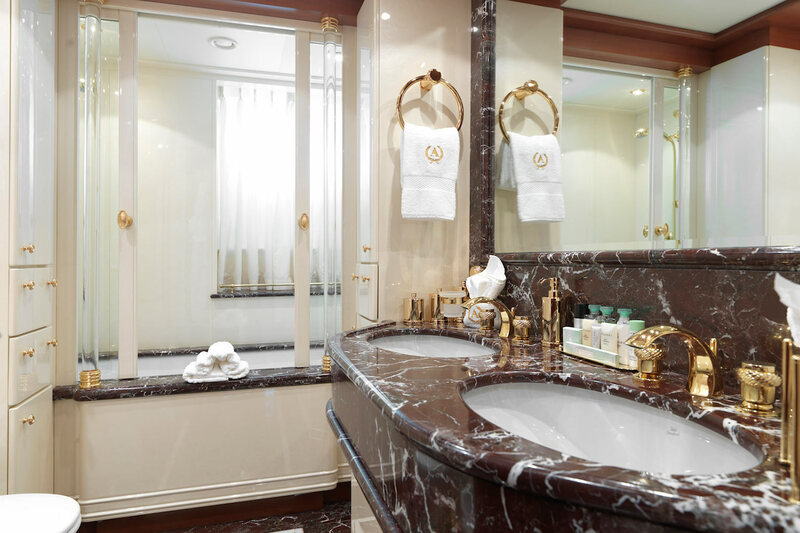 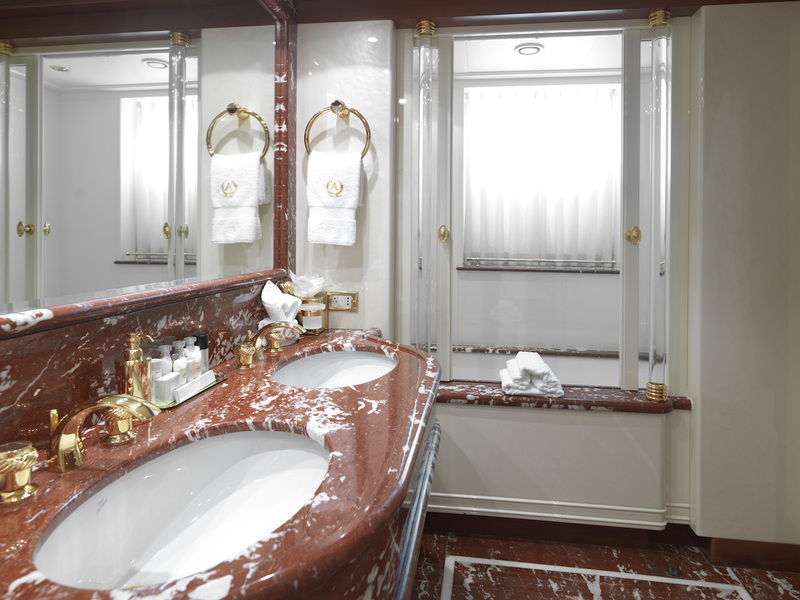 There is also another guest stateroom in the Sky lounge with a double sized bed, a settee, and ensuite bathroom with shower. 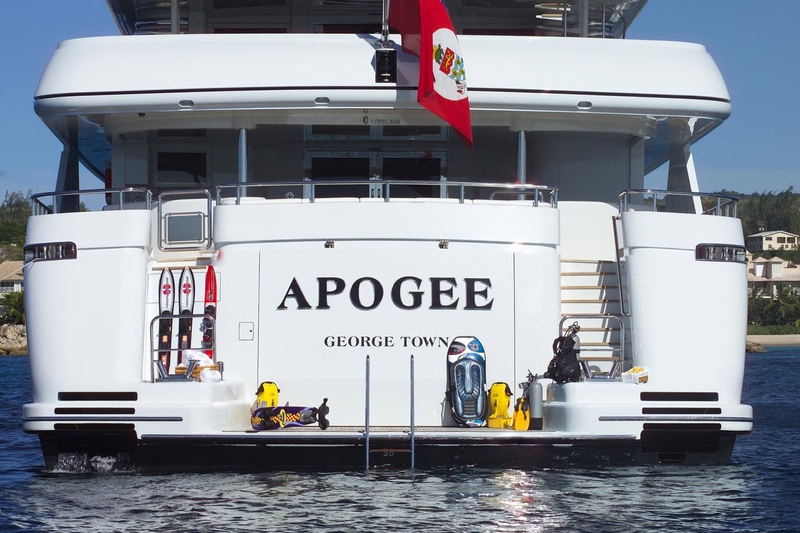 Luxury motor yacht 'Apogee' offers the following yacht amenities and extras: a 12 person on deck Spa Pool pool, two Nouvurania tender dingys with a 300 hp & 230 hp engine respectively, four 3 person Kawasaki water bikes, various scuba diving equipment, water-skis, fishing gear, underwater aft lights, a full air conditioned gymnasium with full equipment, two see through bottomed Explorer kayaks. 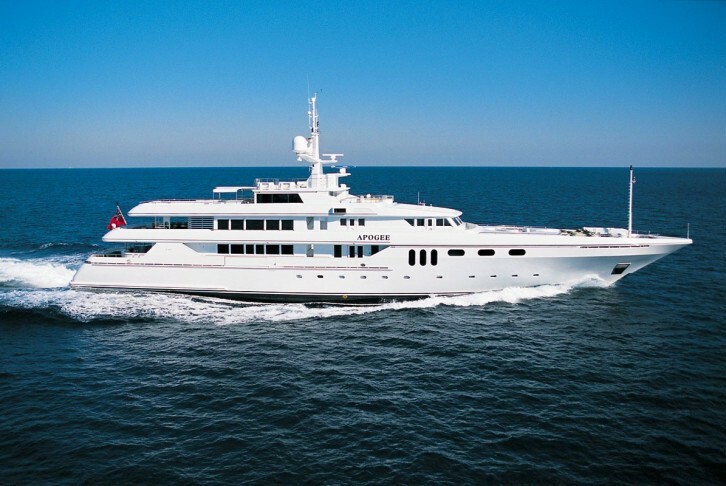 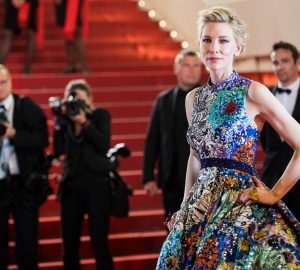 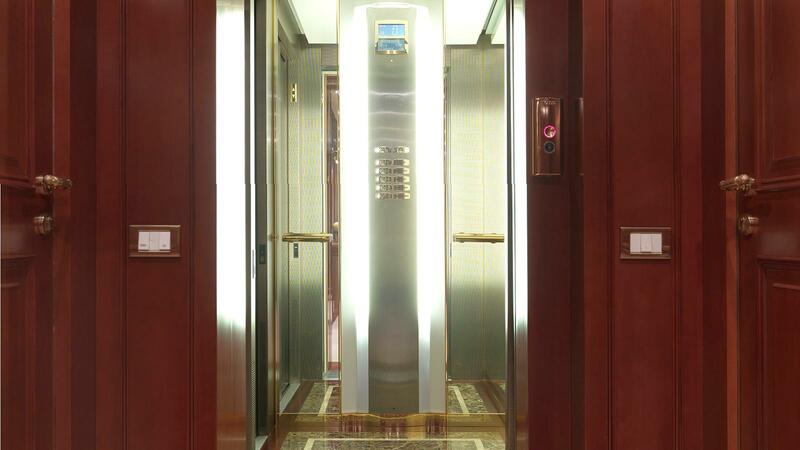 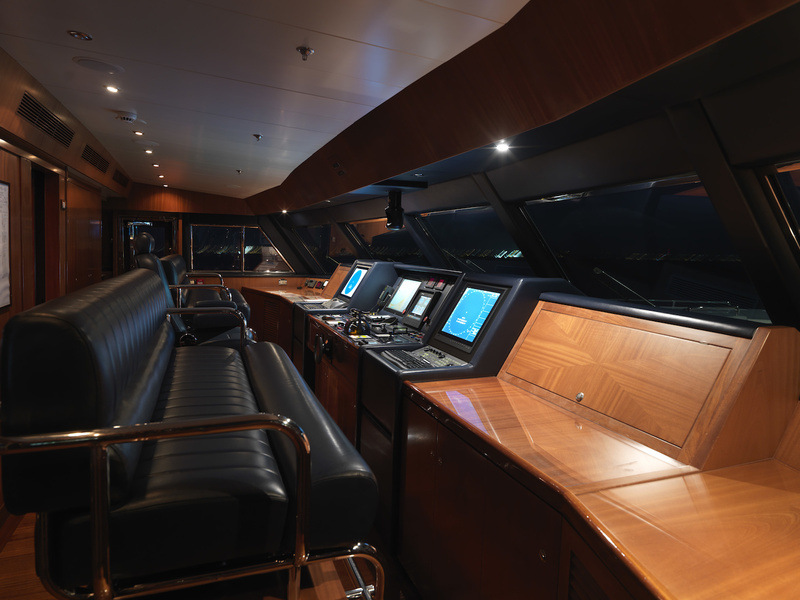 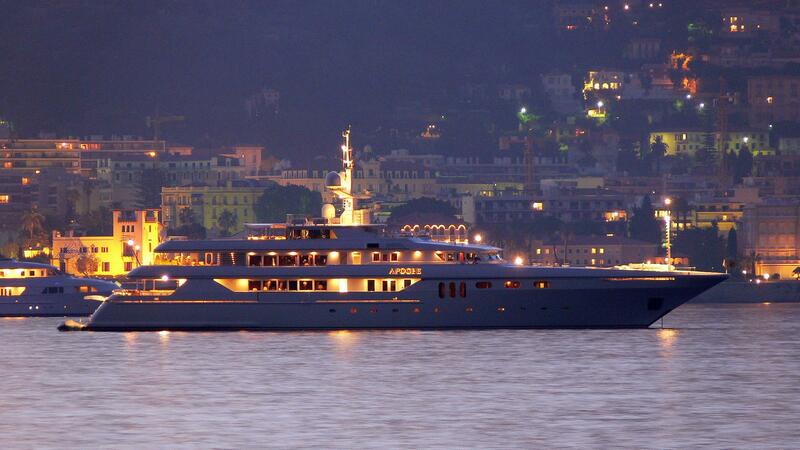 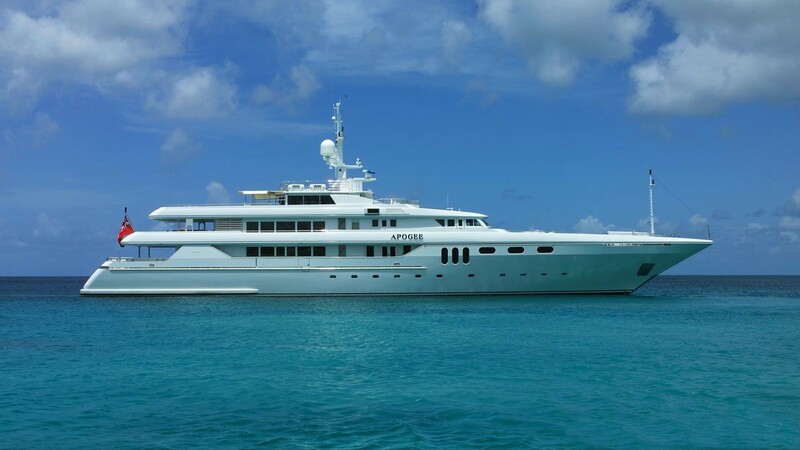 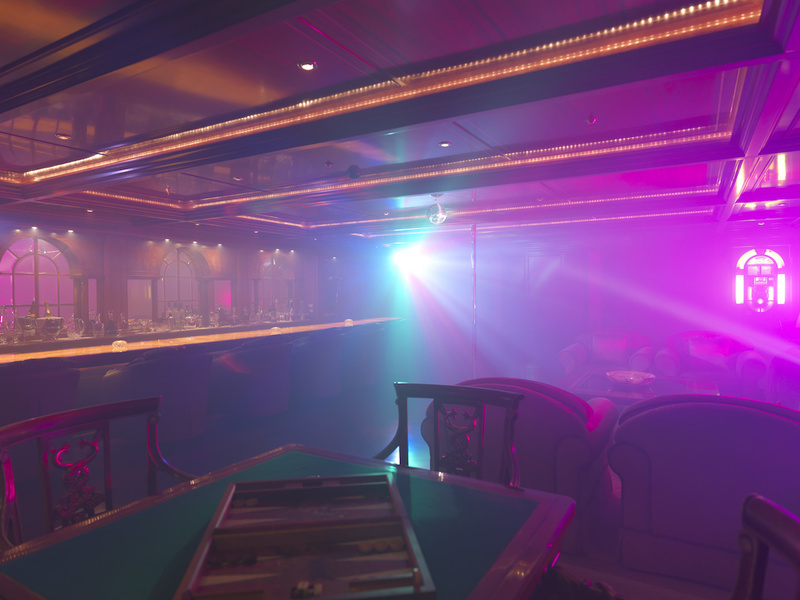 For her internal electronic entertainment she boasts a Plasma LCD Televisions throughout the yacht, a Satellite TV, a Satellite Fax, Bose Surround Sound Hi-Fi equipment, a ‘Wurlitzer’ jukebox, a Karaoke system, and high speed internet access. 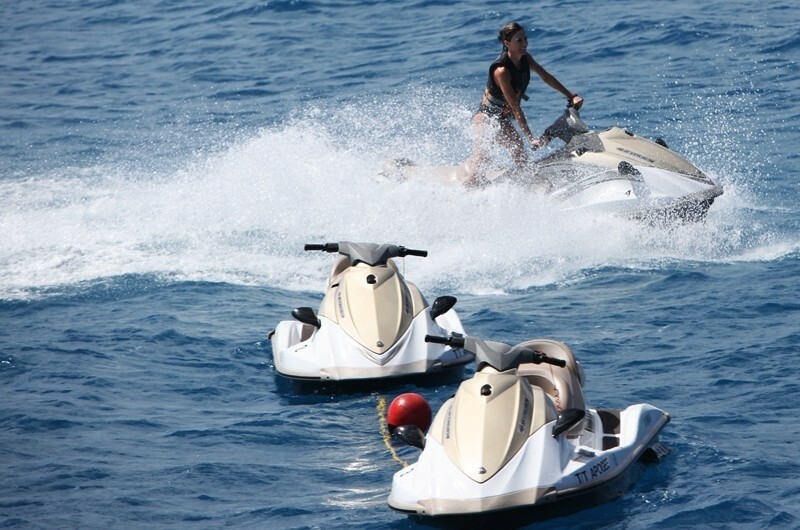 She also has Zero speed stabilizers.